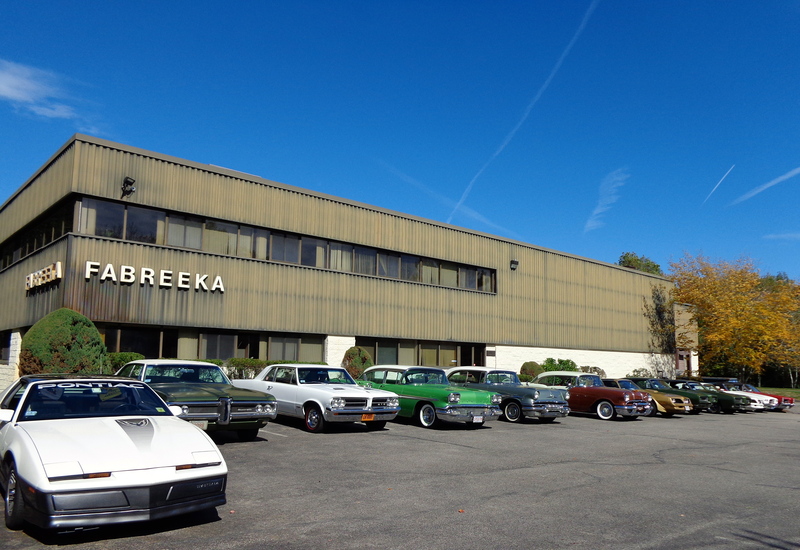 April 14, 2019: Over 30 members and guests in attendance at todays very important meeting. 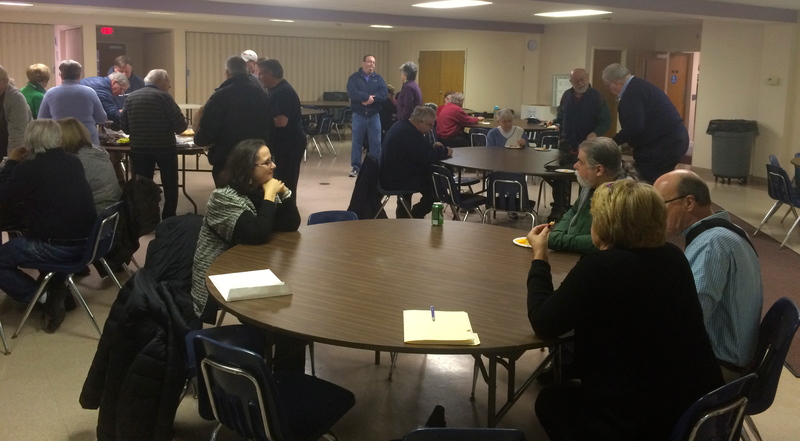 A special election was held to fill openings for President, Vice President and 2 Board of Directors. We are very pleased to announce Ron Senesi, Andy Epstein, Mitch Gage and Matt Shu were elected to these positions. Thank you to Paul O’ Toole who served honorably as our President during the 3 month interim period. The club also overwhelmingly voted to host the National POCI Convention at Mohegan Sun in July 2021! 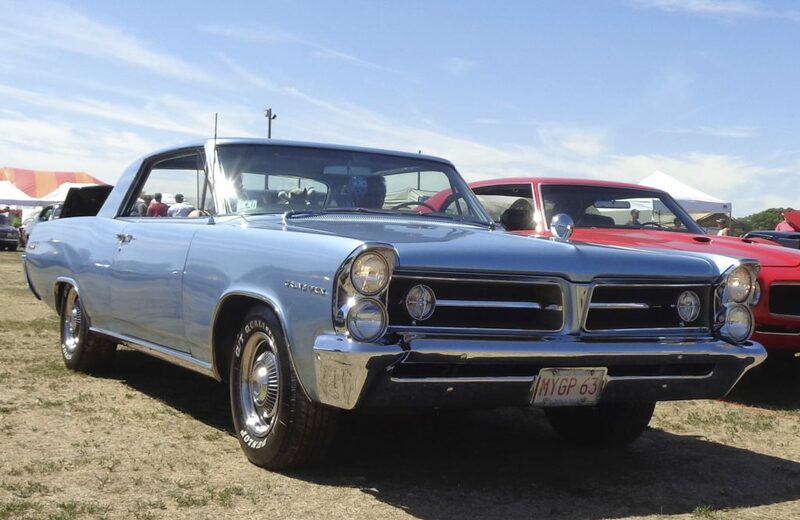 Stay tuned for more details on what will be a spectacular Pontiac event in our own backyard. A Big Thank You goes out to Judy and Jim May for hosting today’s activities. 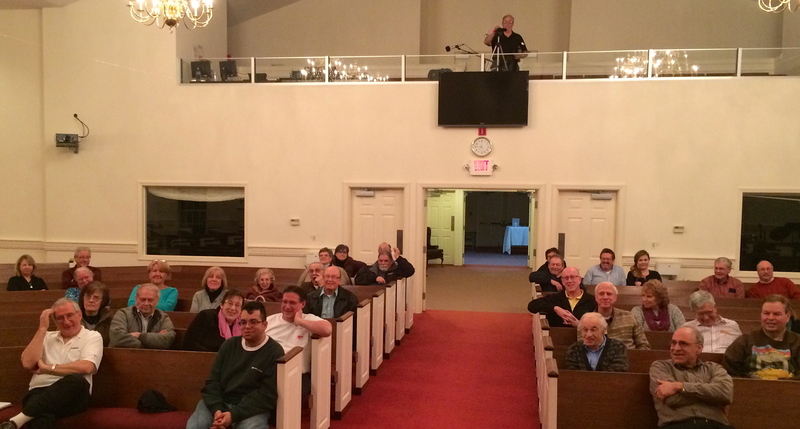 March 9, 2019: Very nice turnout at tonights club party at the Westgate Church in Weston, MA. Club President Paul O’Toole welcomed the group and officiated our meeting. Wonderful entertainment provided by A Cappella Gold. Delicious dinner catered by the nice folks at The Chuck Wagon in Dedham. 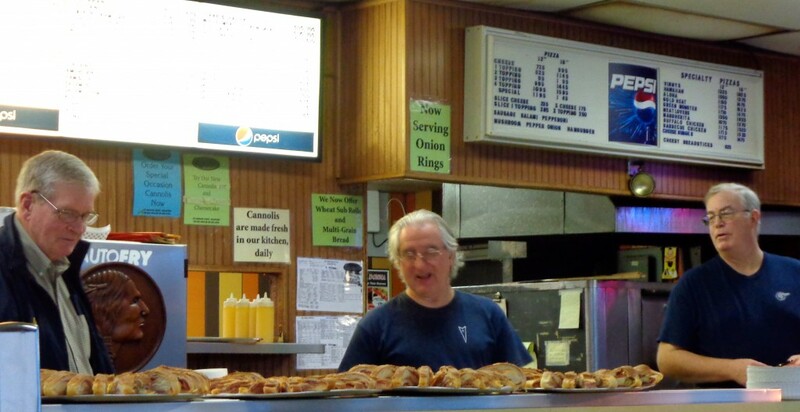 Big thank you to Steve Peluso for coordinating the nights activities. 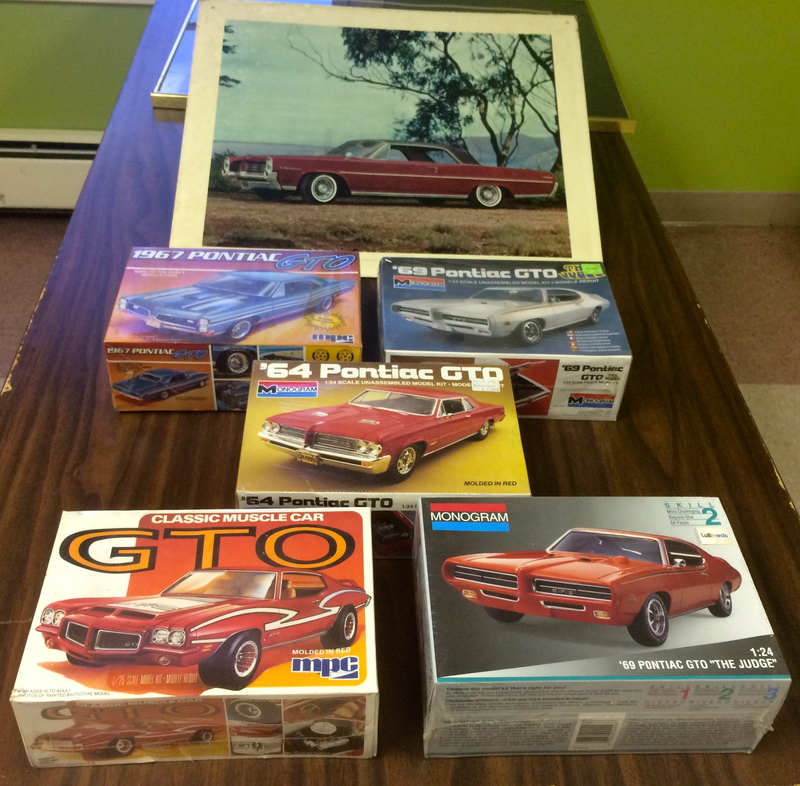 Our raffle netted over $350 for the Pontiac Oakland Museum in Pontiac, IL! Great to have Larry Crider and Art Barrett from the national club in attendance. 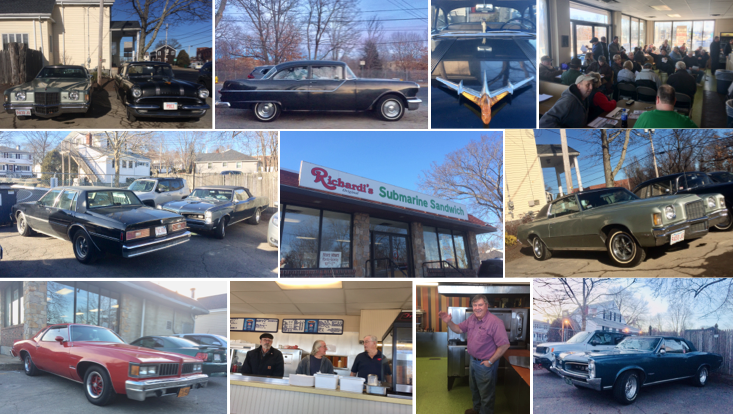 January 13, 2019: Full house at todays meeting and elections at Richardi’s in Braintree, MA. Over 60 members and guests covering 5 states participated in our first gathering of 2019. Congrats to those who were (re)elected to office and to our new Lifetime Member Honoree, Merle Green for his dedicated service to the Yankee Chapter and to the national POCI organization. Well deserved Merle! Big THANK YOU to Dan Richardi who always does an outstanding job hosting our January event. 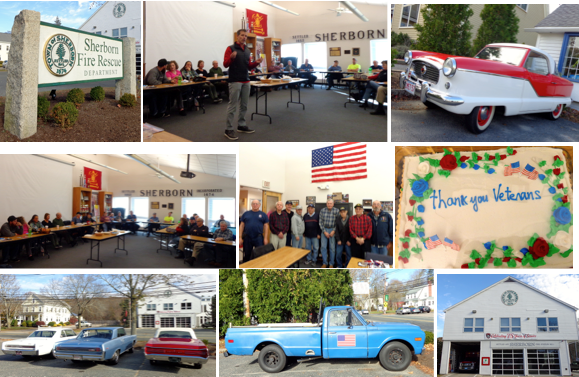 November 18, 2018: 40 members and guests including 6 of our military veterans were in attendance at this afternoons meeting at the Sherborn Fire House. On the agenda were the upcoming club elections to be held in January. 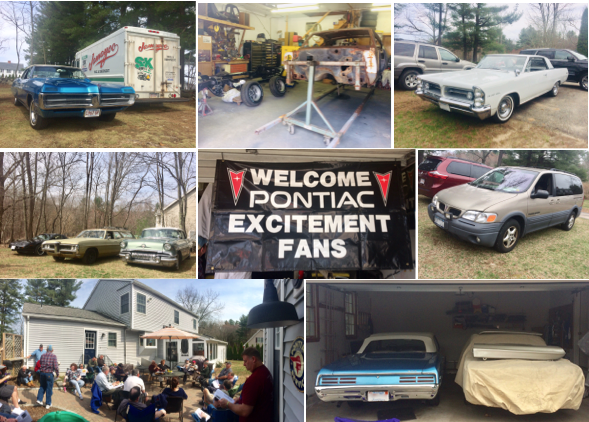 Big THANK YOU to our hosts, Judy and Bruce Muldoon. 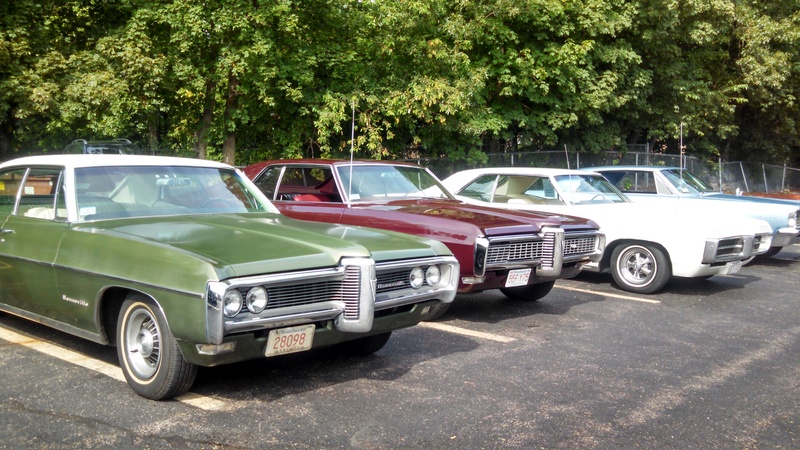 October 14, 2018: A crisp cool Autumn day was perfect for our annual Fall Foliage Cruise thru central Massachusetts. 22 members and guests arrived at our starting point in Milford. 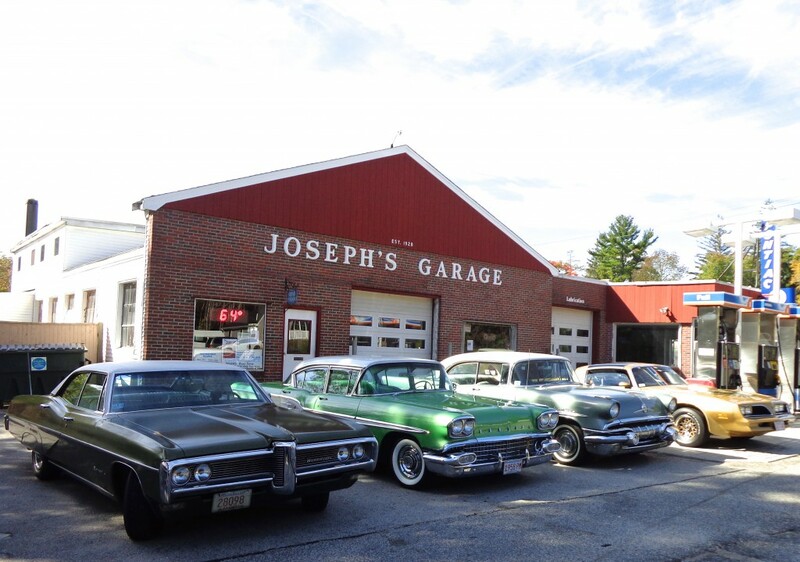 We headed north on scenic route 140 and arrived at High Octane Performance Cars in Boylston for our club meeting. 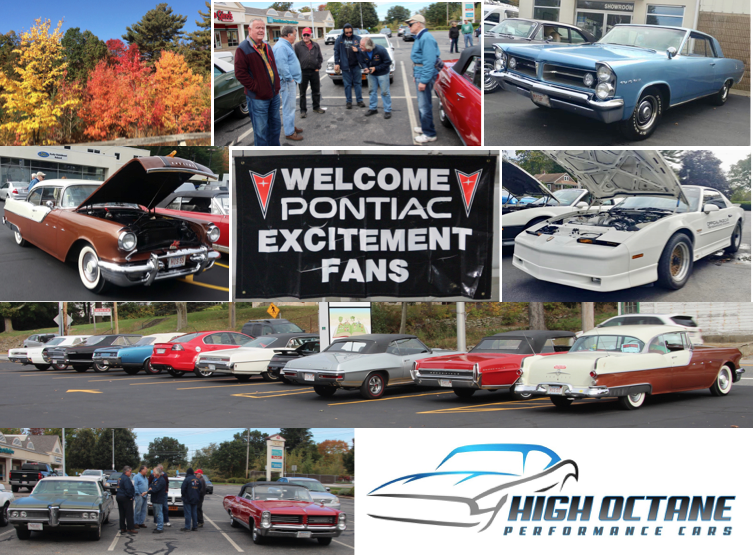 Many thanks to the team at High Octane for hosting todays event. 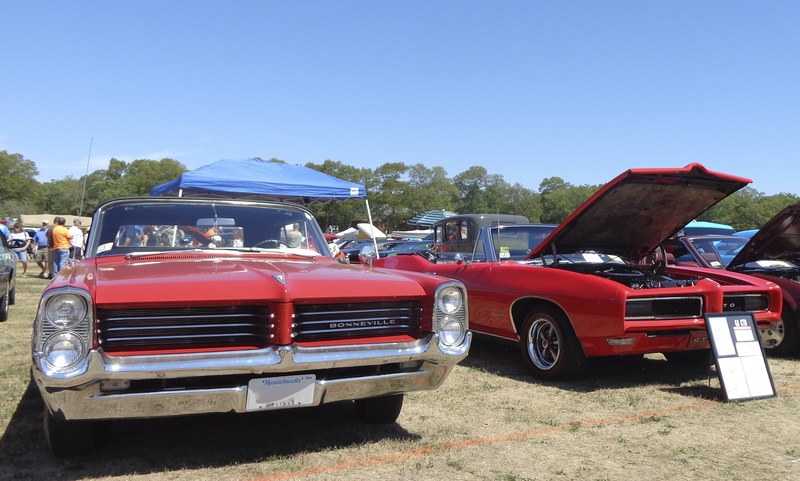 September 22, 2018: Great turnout by Pontiac (and Oakland) enthusiasts at this years Pontiac Celebration in Warwick, RI. 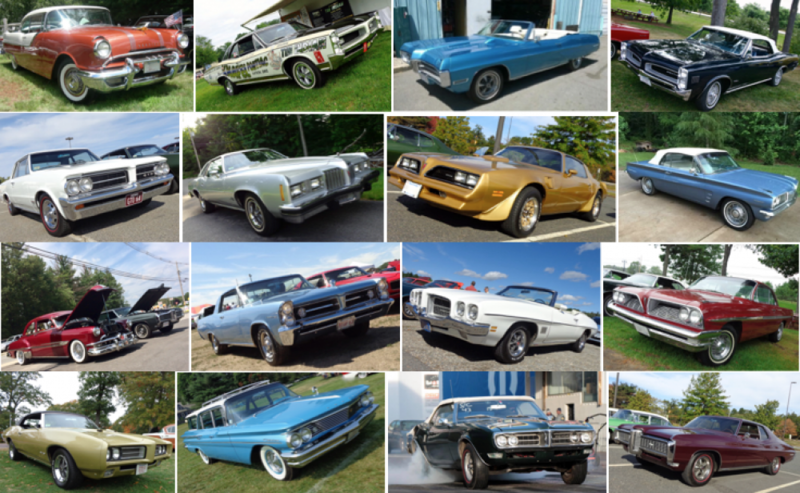 Cars from all over the northeast were showcased at this outstanding and charitable event. 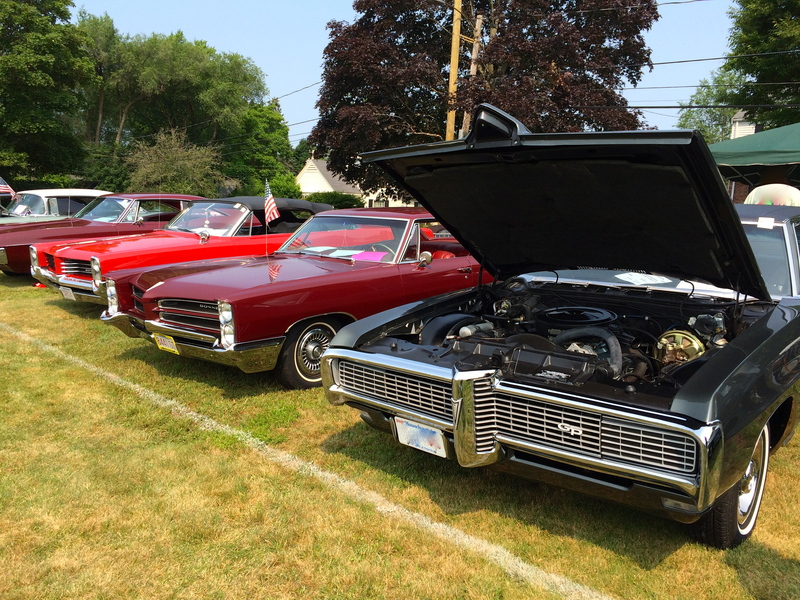 Congrats to Rick and Lucille DiGiacomo and all the volunteers for putting on another wonderful show. 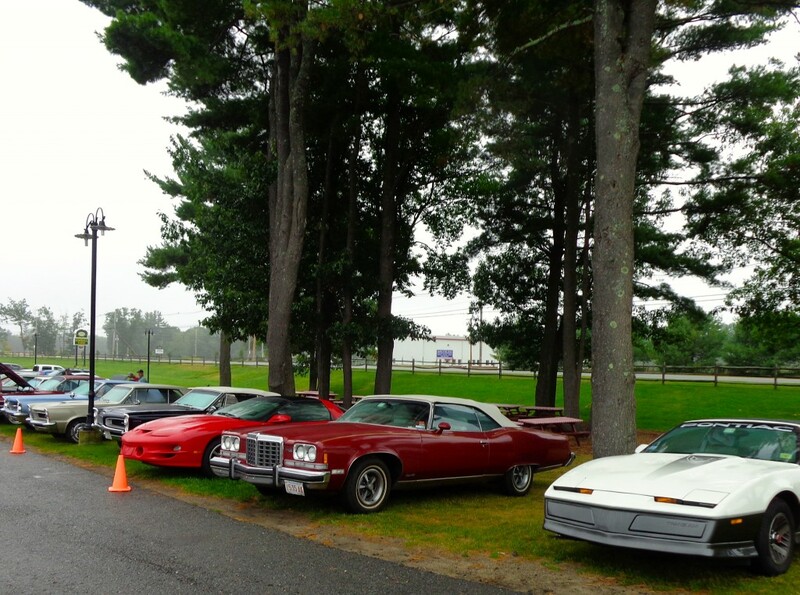 August 25, 2018: Mother Nature came thru for us as we had over 50 cars participate in todays Tuck Trucks Yankee POCI Car show. 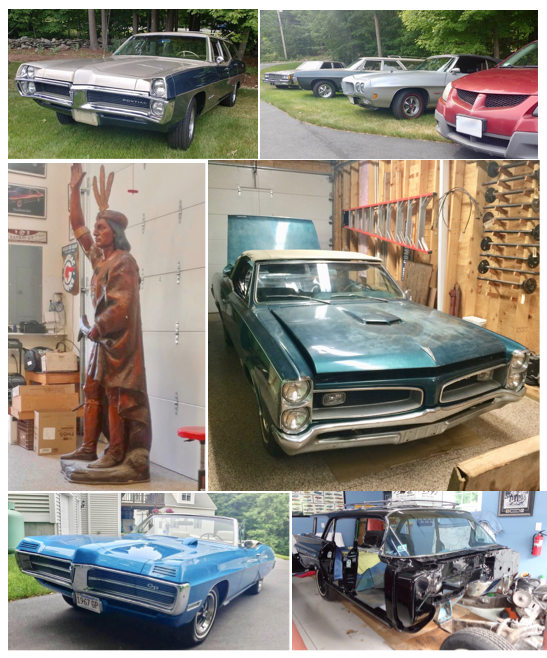 We filled the lot at Tucks with everything from Fieros to Chieftains. 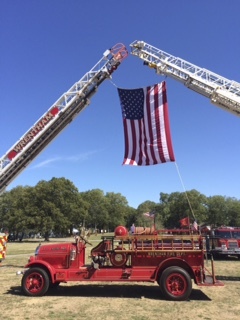 Thanks Jim, Mark and the entire Tucks Trucks team as well as all our show sponsors including Georgetown Insurance, LMF Jewelry, Papa Gino’s, VeeBop Ice Cream and Ames Performance. 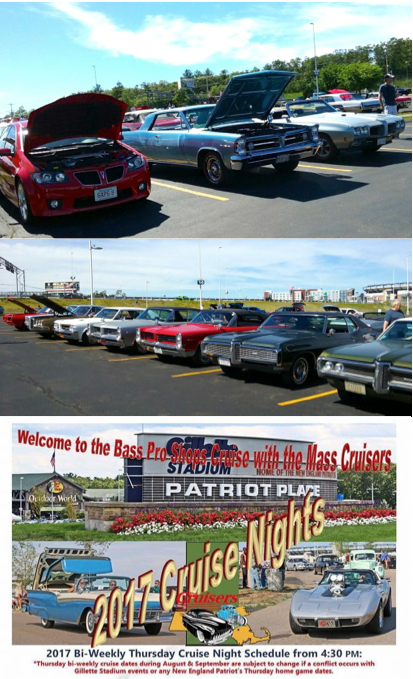 July 19, 2018: Beautiful afternoon and evening for our Pontiac Day at Patriot Place Cruise hosted by the Mass Cruisers. Lots of Pontiacs in attendance. 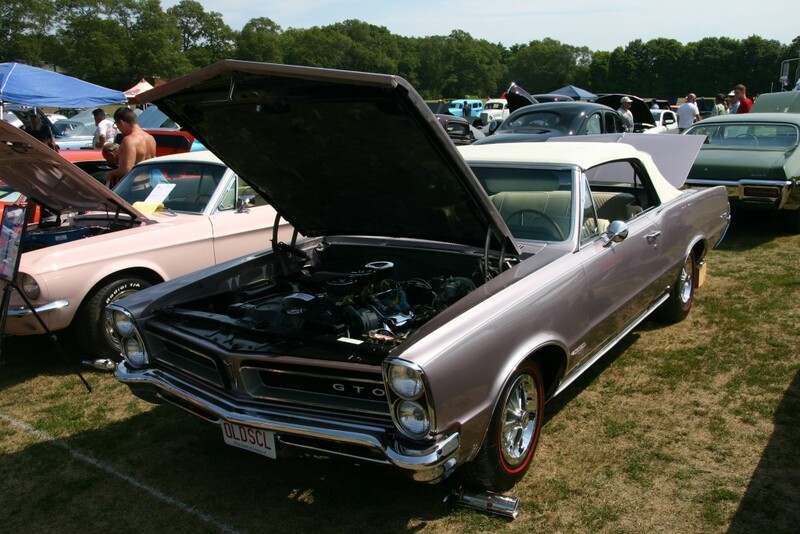 This bi-weekly event is held in the shadow of Gillette Stadium and is one of the more popular cruise nights in eastern MA. 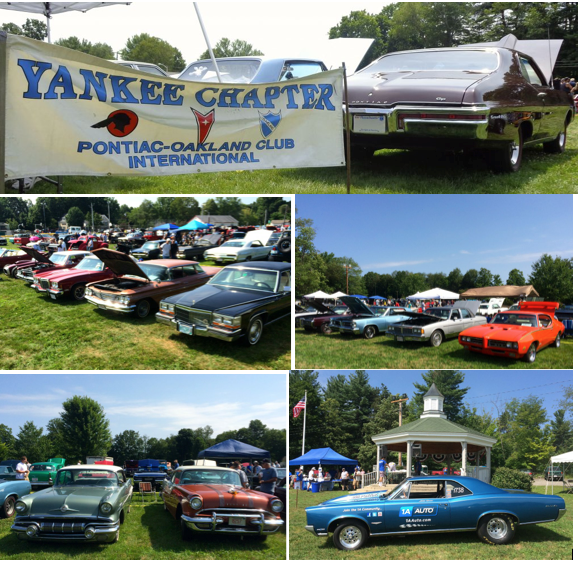 July 8, 2018: Yankee POCI very well represented at todays BSAAC Show in Dedham. 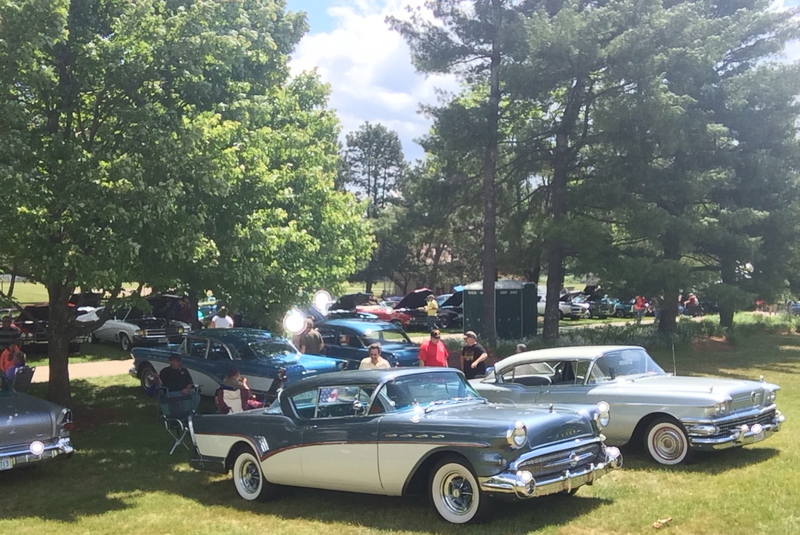 Over 60 members were in attendance on a picture perfect day. 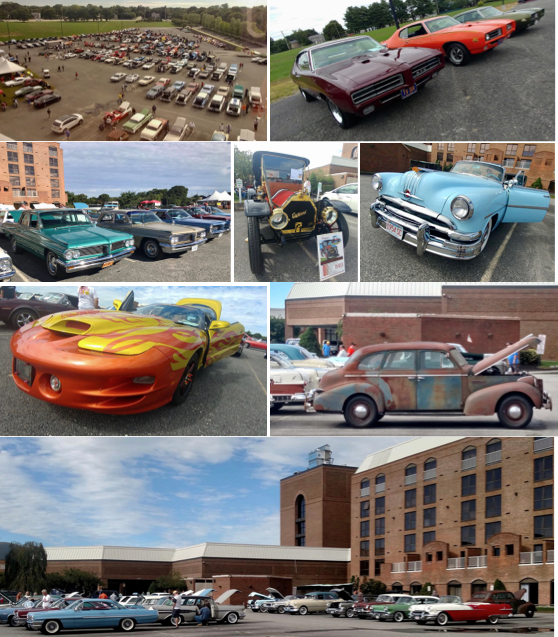 Big crowds overall and a wonderful vendor area and car corral. Great job by our hosts, the BSAAC. 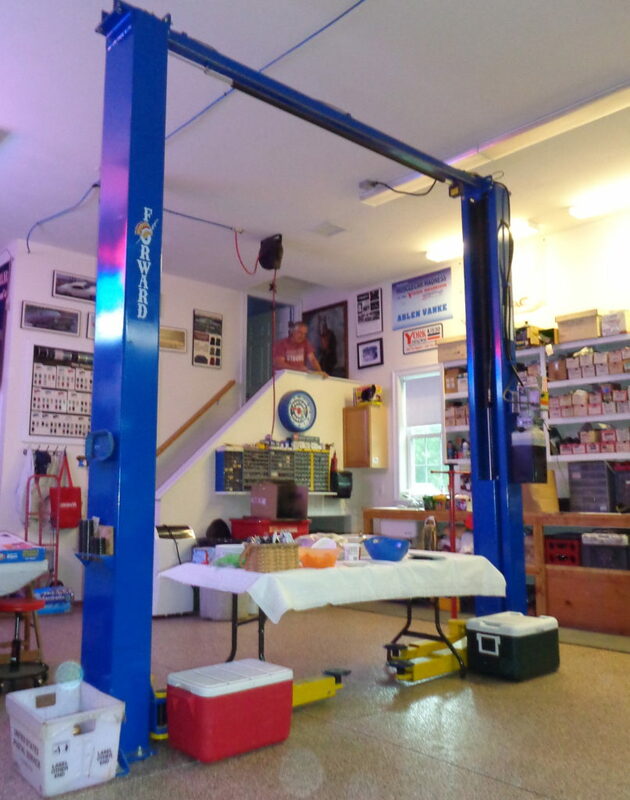 June 16, 2018: 20+ members were present at our club meeting hosted by Janice and Merle Green. 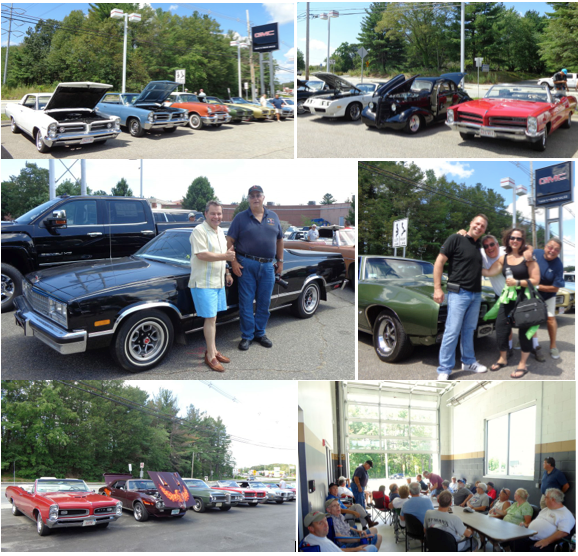 On the agenda was a recap of our upcoming shows and activities including our big cruise at Tucks Trucks on August 12th. A few of our club members will be traveling to this weekends National POCI Convention at the Wisconsin Dells. 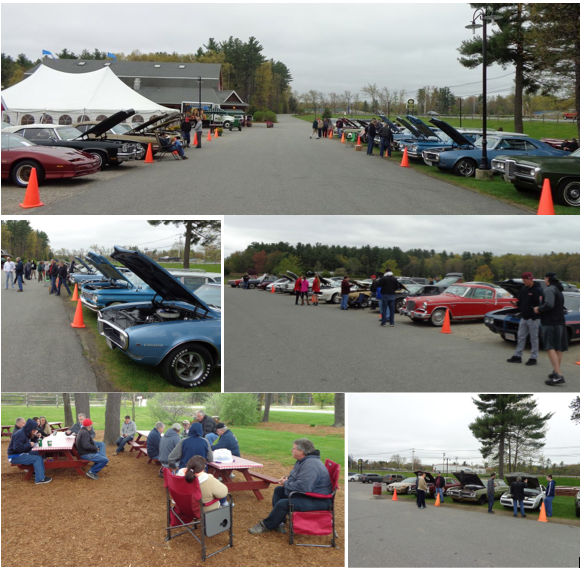 May 12, 2018: 20 members and guests braved todays cool rainy weather for our annual Dust-Off and meeting. 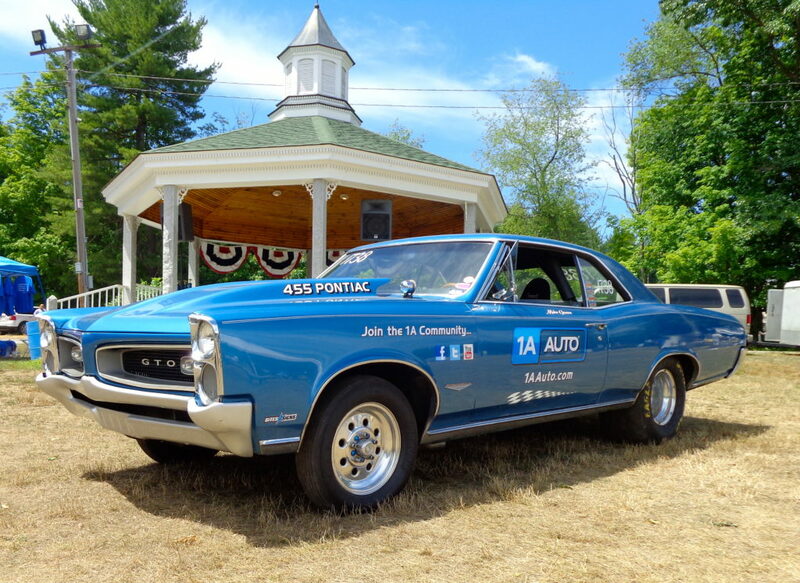 Special THANK YOU’s to our host Marybeth and the team at Kimball Farm in Lancaster and to Heather from Ames Performance for her generous promotional support. Our event wouldn’t have happened without the coordination by club member and new Northeast POCI Director Ron Senesi and his wife Julie. April 8, 2018: Over 40 members and guests participated in this afternoons meeting. We discussed the upcoming show season and have alot of activities planned for 2018. A big THANK YOU to our hosts, Judy and Jim May. 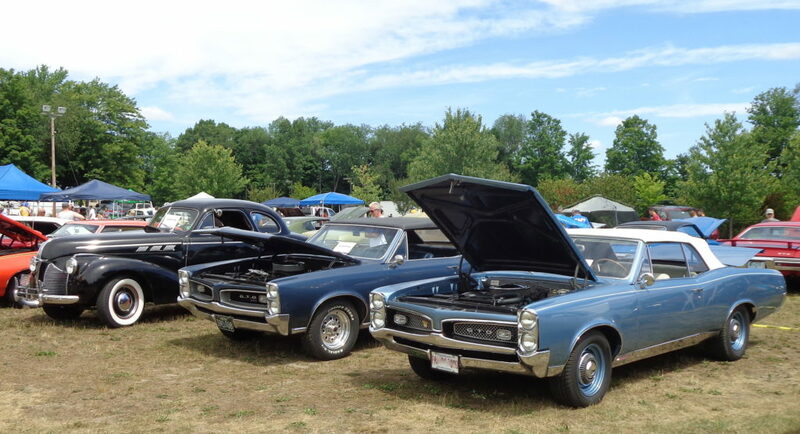 Our next meeting will be at our DUST-OFF on May 12th at Kimball Farm in Lancaster, MA. Hope you can join us. 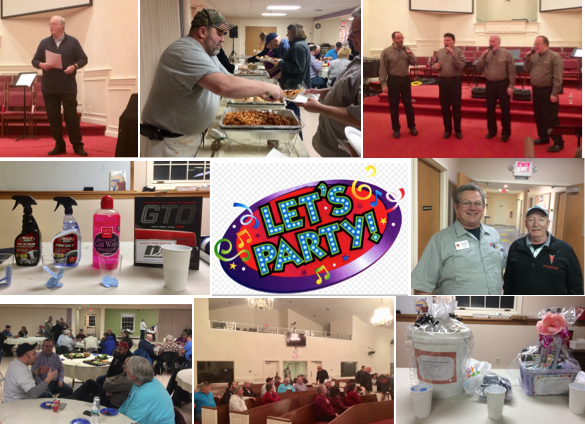 March 10, 2018: Over 60 club members and guests gathered for our club party held at the Westgate Church in Weston. 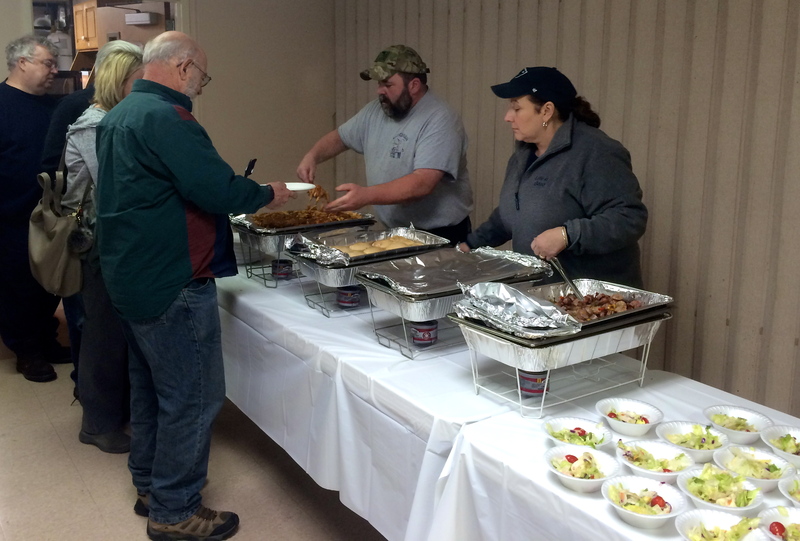 A delicious buffet was provided by Chuck Wagon Catering in Dedham. 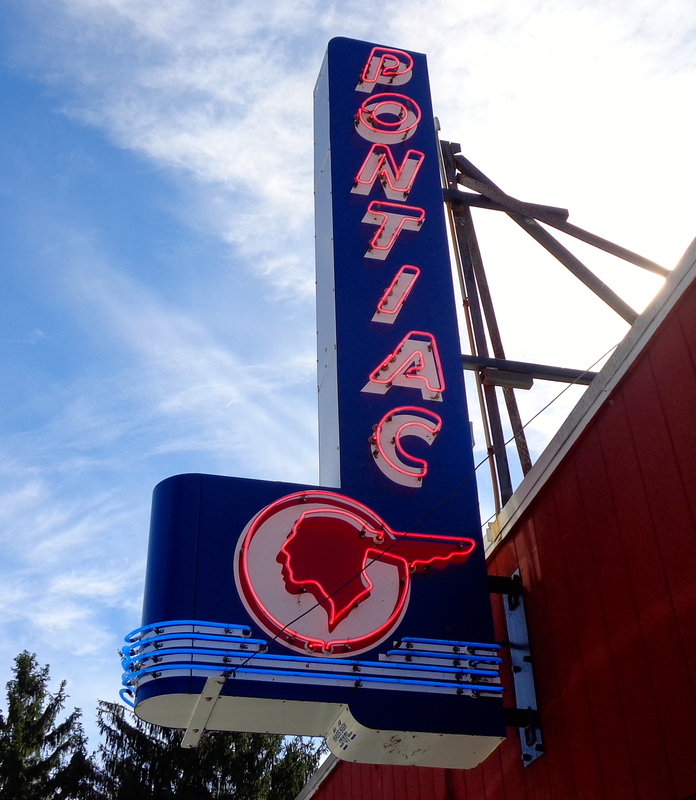 In addition to good friends and food, we raised over $700 for the Pontiac Oakland Museum in Pontiac, IL. Big THANK YOU to Steve Peluso for organizing the event and to Ann Marie Mandarano, Julie and Ron Senesi for coordinating the dessert table and raffle. January 14, 2018: Our first club meeting of 2018 kicked off with a great crowd of close to 70 members and guests. Club Prez Tony Domurat chaired todays events which included a summary of our upcoming activities. Tony was also acknowledged by the membership for his tireless efforts in leading the club. A big THANK YOU to our host, Dan Richardi, who provided a spectacular variety of food dishes for all to enjoy. 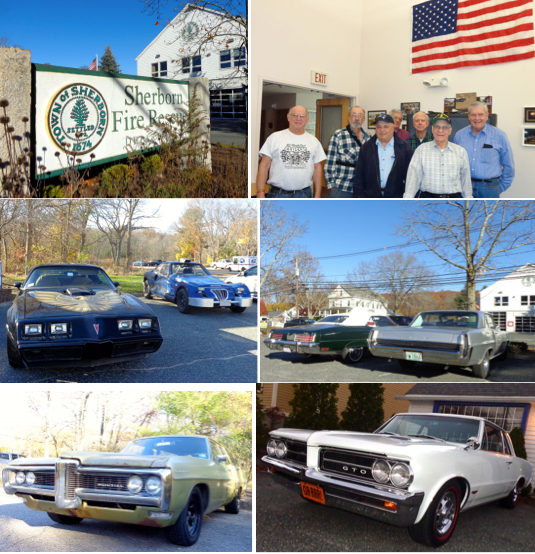 November 11, 2017: Brisk temperatures and sunny skies greeted close to 50 members and guests to the Sherborn Firehouse for our important November meeting. 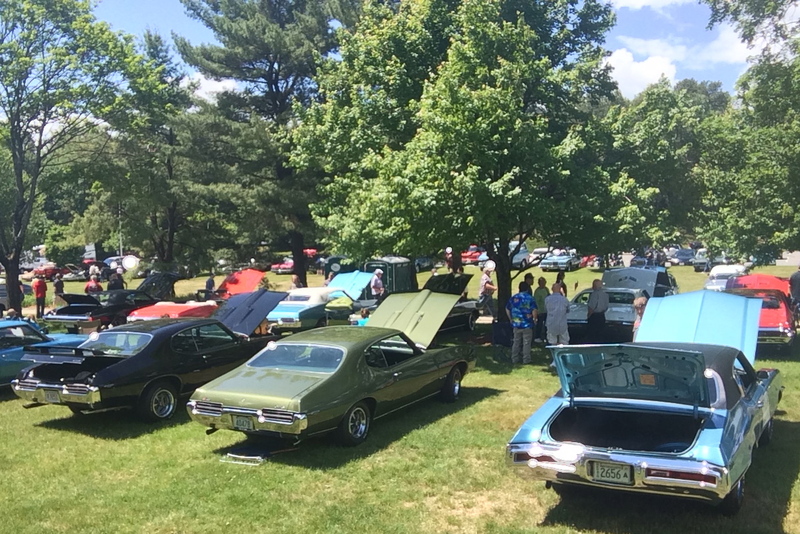 Club sponsor, Steve Mollohan from Georgetown Insurance, spoke about classic car insurance and the benefits of using Hagerty. Steve is one of the largest Hagerty agents in the area and he provided great advice for our attendees. 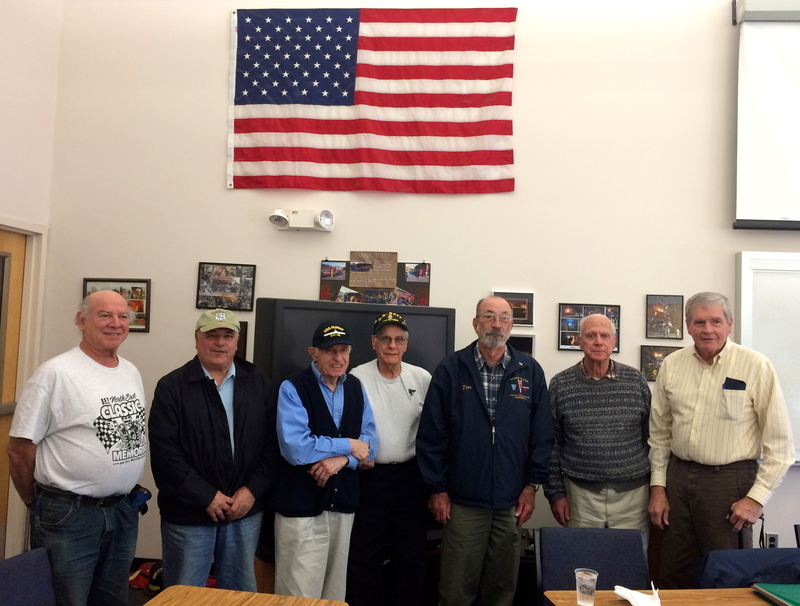 We also welcomed and thanked all members who served in our nations military as we mark this Veterans Day weekend. Big THANK YOU to Judy and Bruce Muldoon for hosting this afternoons activities. 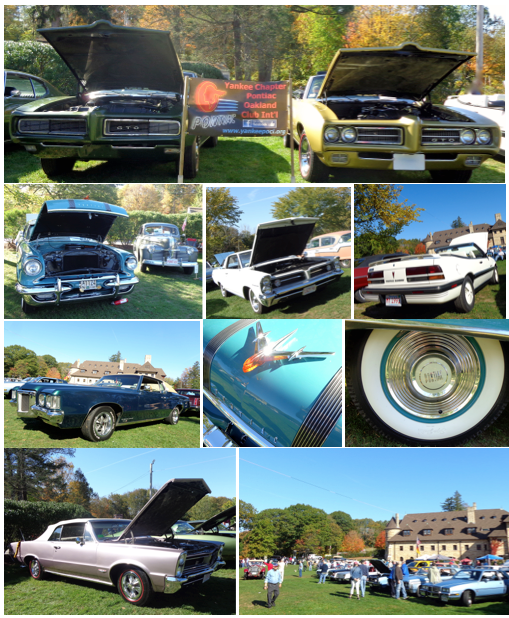 October 21, 2017: Over a dozen Pontiacs participated in today’s Extinct Car Day at the Larz Anderson Museum of Transportation. 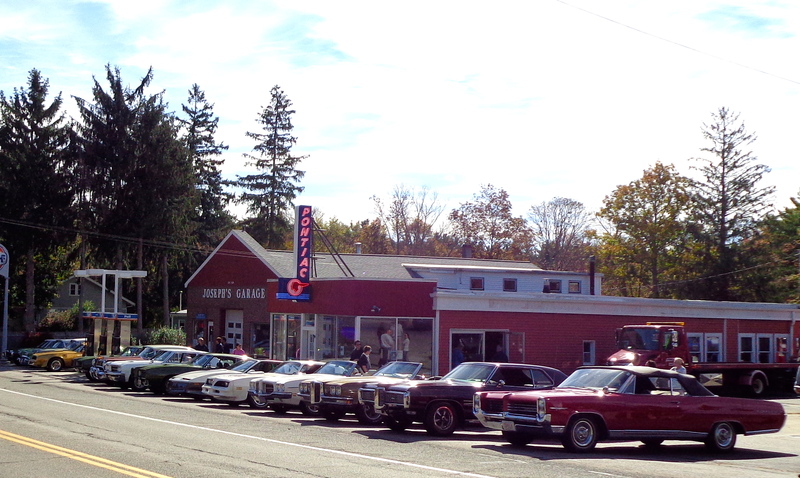 Sunny skies and unseasonably warm temps made for a perfect Autumn day at the MOT. 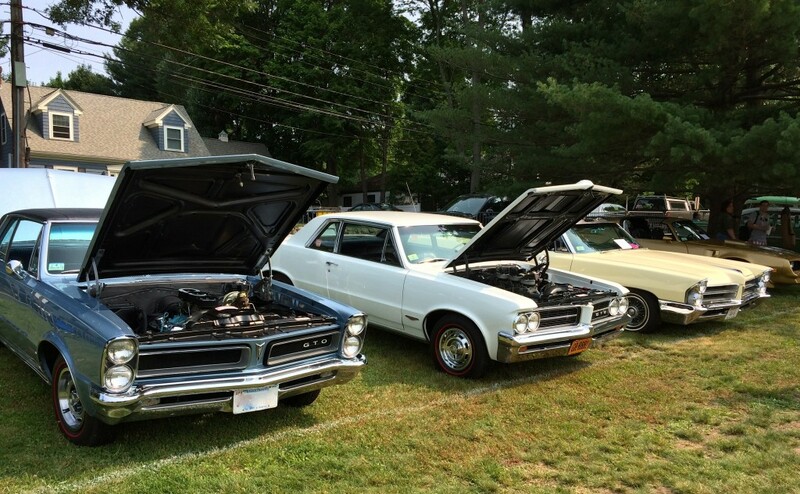 Lots of classics on hand. 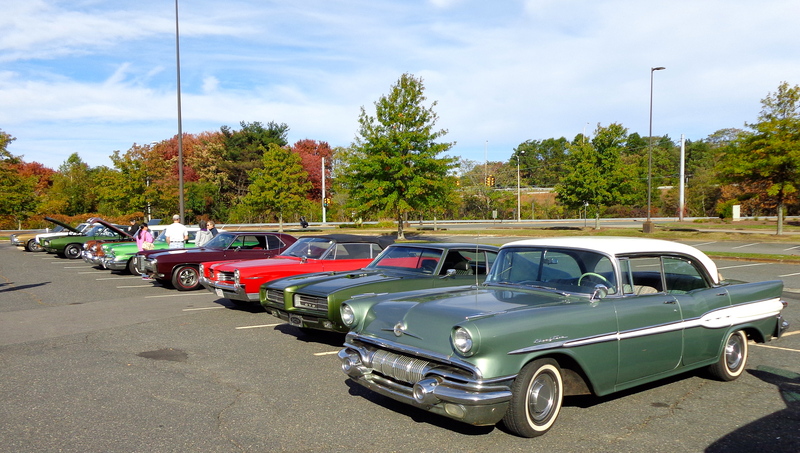 October 15, 2017: Over a dozen cars and twenty members and guests participated in our annual Fall Foliage Cruise. 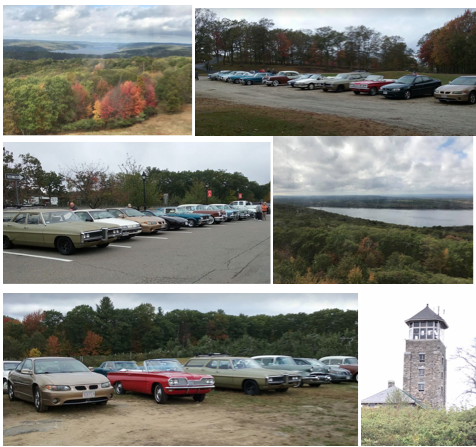 This year we drove thru the Quabbin reservoir and parts of the Pioneer Valley. Autumn colors were bursting. Good time had by all. 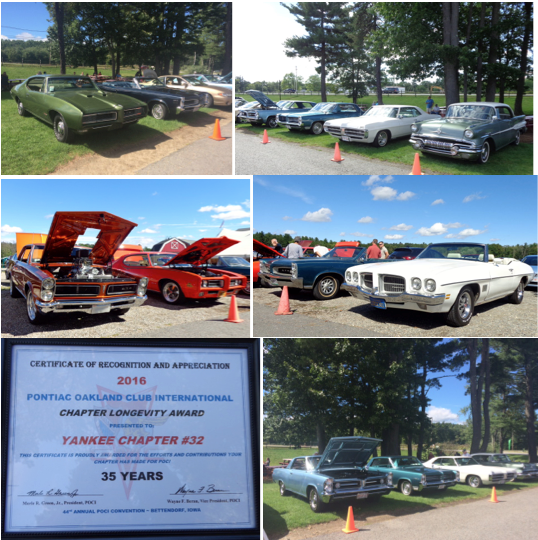 September 10, 2017: Beautiful day at Kimball Farms in Lancaster, MA for our club meeting. 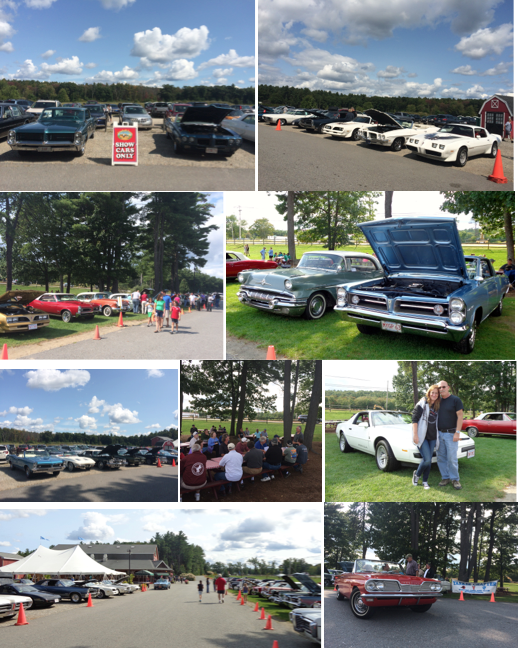 Outstanding crowd of 40 cars and 60 members and guests. 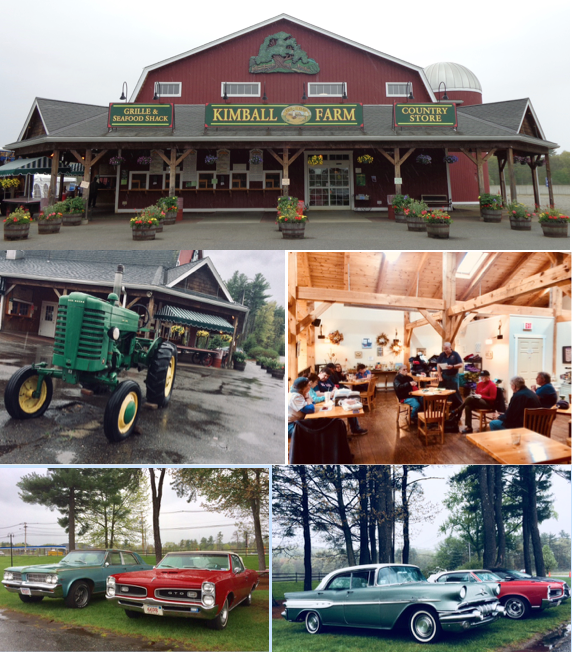 Big Thank You to Julie and Ron Senesi for coordinating todays event along with the wonderful staff at Kimball Farms. 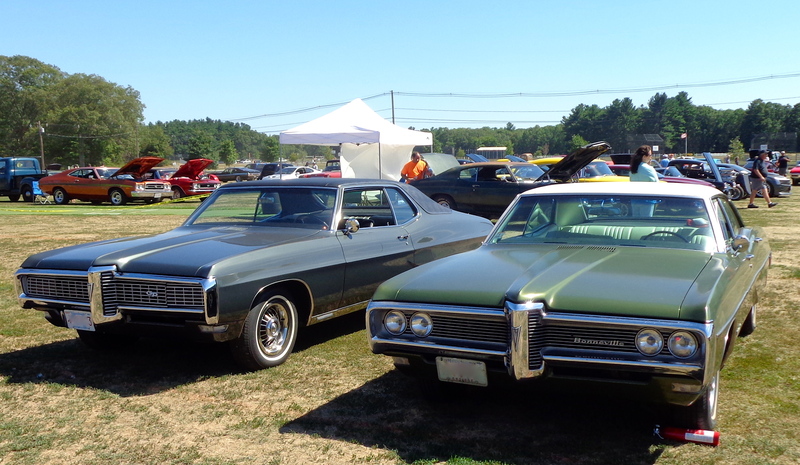 August 20, 2017: Beautiful day for the Mass Cruisers Autofest at the Wrentham Fairgrounds. 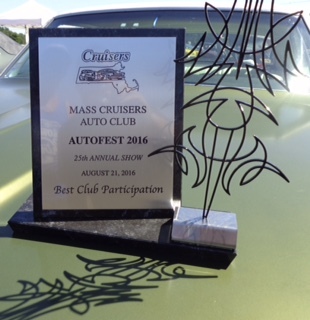 Outstanding turnout by Yankee POCI as we received the award for Best Club Participation. This is the 6th consecutive year we have won this honor. 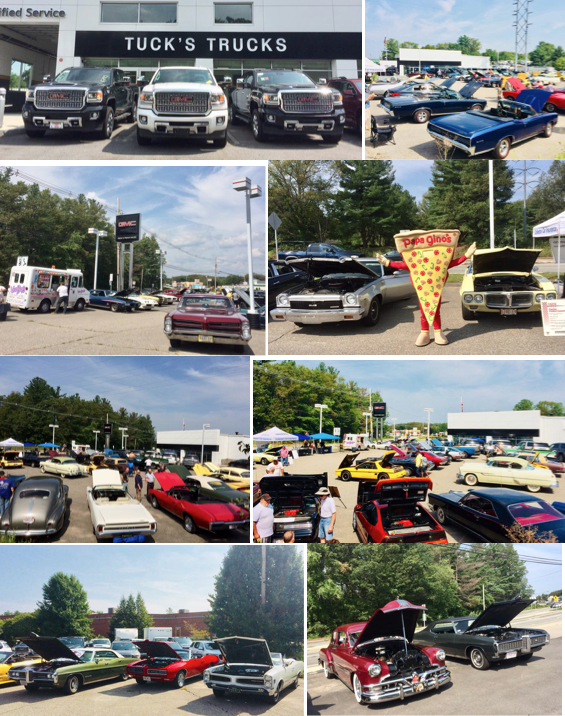 August 13, 2017: Yankee POCI members and guests turned out in big numbers to our Tucks Trucks-Yankee POCI Car Event held at Tucks Trucks in Hudson, MA. 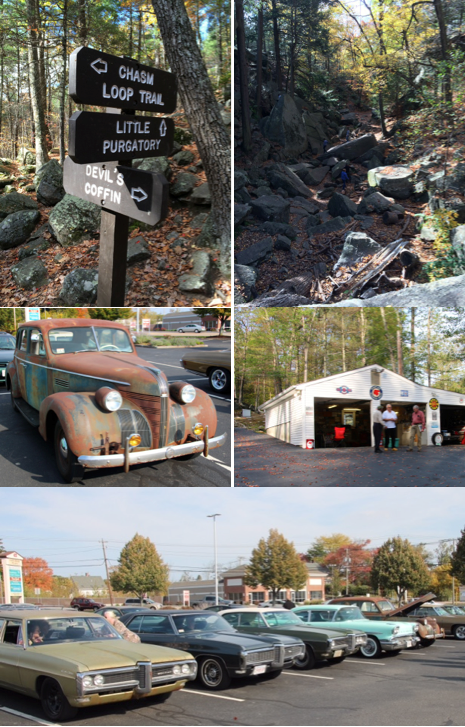 Big THANK YOU to Jim Boyle, Mark and Lisa Viitala and the team at Tucks for hosting todays activities. Great day had by all. 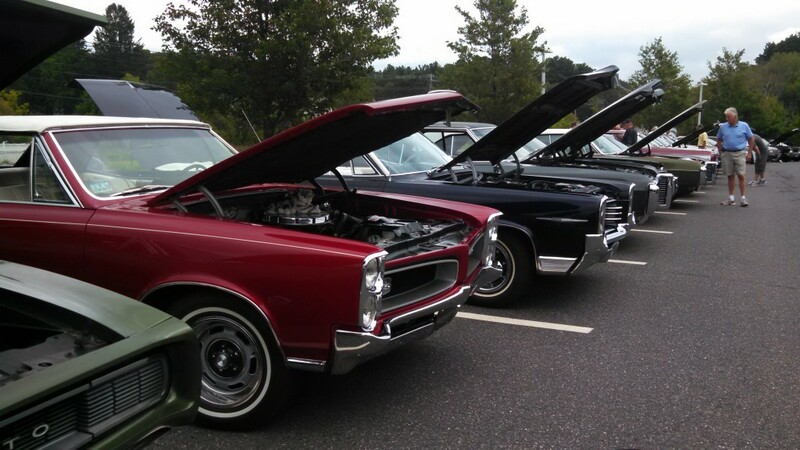 July 23, 2017: Strong Pontiac turnout at the 1A Auto Charity Car Show in Pepperell. Sunny skies and cooler temps made for a spectacular day at the town field. 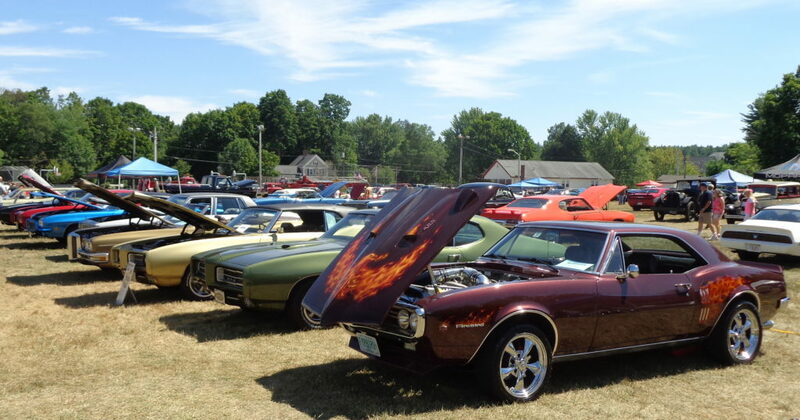 Over 250 cars showed this wonderful event. June 22, 2017: The stars were out at Gillette Stadium in Foxboro, MA tonight but they weren’t Brady, Gronk, and Edelman. 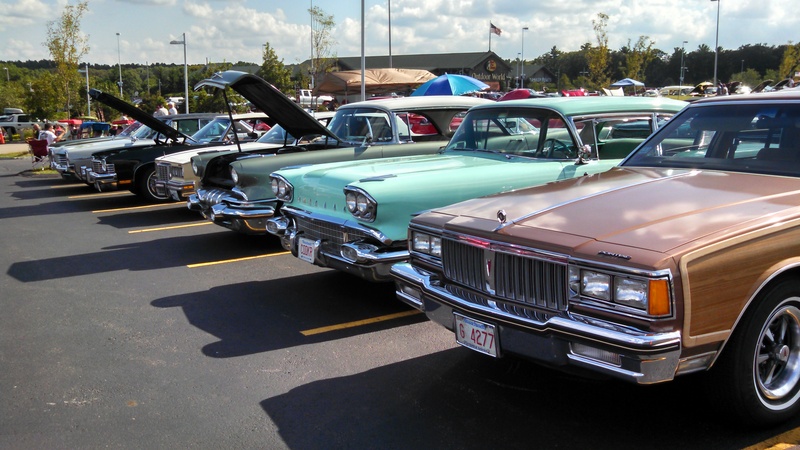 Instead Pontiacs were the feature attraction at the Mass Cruisers Show at Bass Pro Shops , Patriot Place. 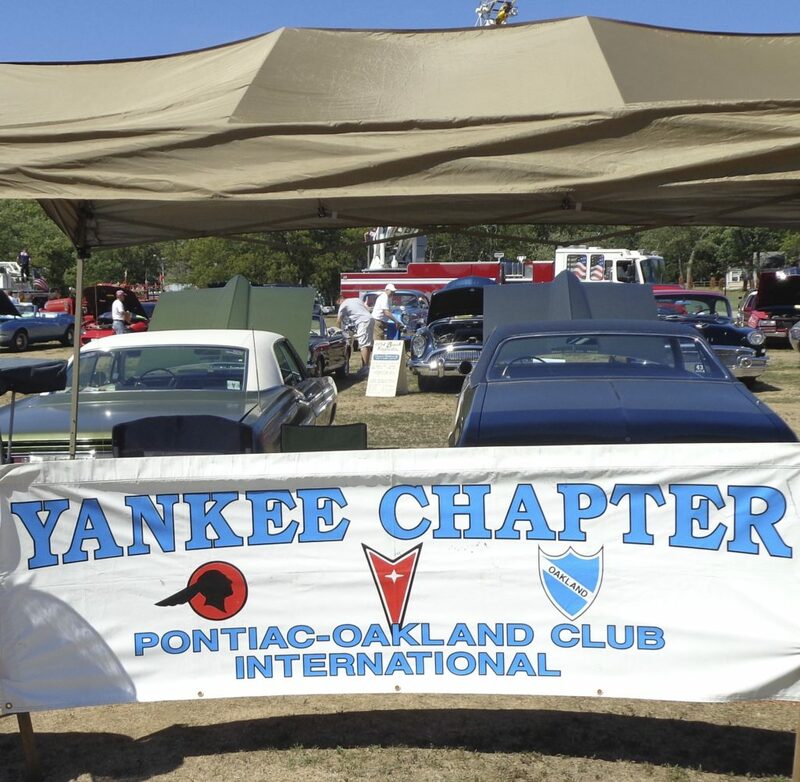 We had a solid group of Yankee POCI members representing our brand under beautiful clear skies. Check out those split grills below. 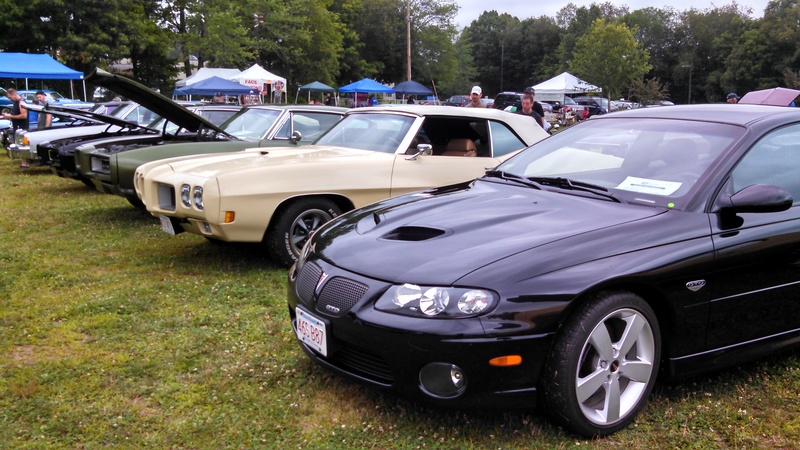 May 13, 2017: WOW…..overcast skies and the threat of major downpours didn’t discourage 20+ club members and over 30 cars from participating in our Spring Dust-Off at Kimball Farm in Lancaster, MA. A Big Thank You to Ron and Julie Senesi who coordinated today’s activities with the good folks at Kimballs. Also a big shout out to Heather from Ames Performance and Steve from Georgetown (Hagerty) Insurance for contributing to our goody bags given to all participants. 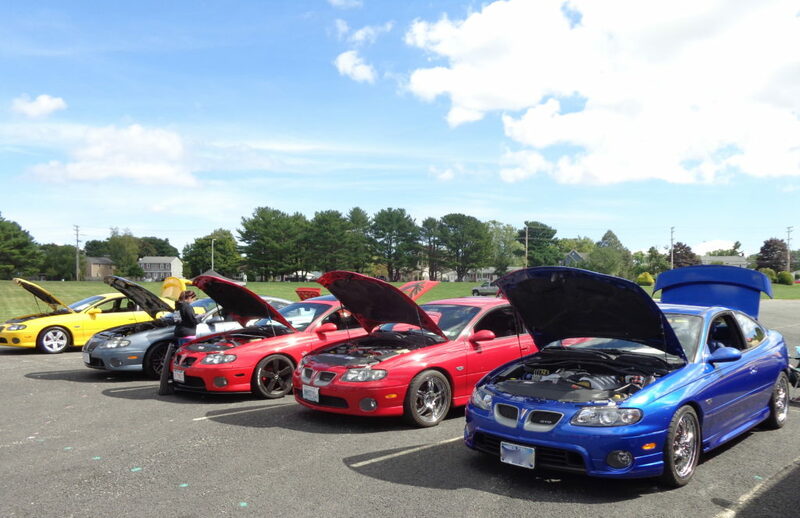 April 30, 2017: Sunny skies and a gentle breeze greeted 8 cars and 11 members for our Spring Cruise. Paul O’Toole mapped the route and lead the charge as we meandered thru the backroads and villages of Rockport, Gloucester, and Essex. 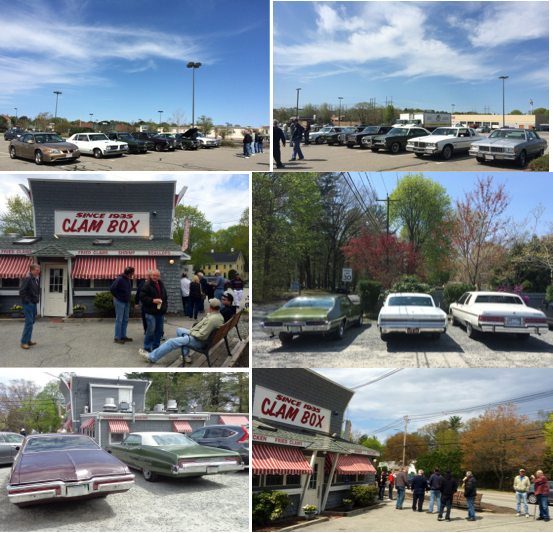 After a 90 minute cruise, we stopped at The Clam Box in Ipswich for a nice lunch and conversation. 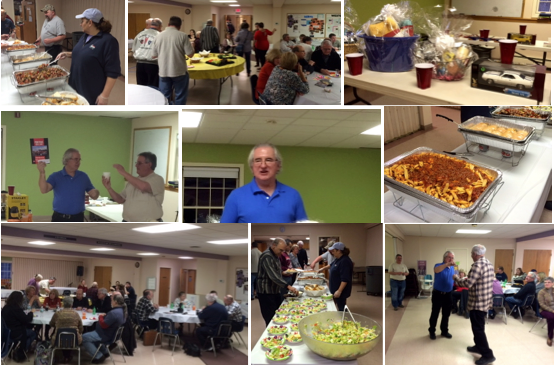 March 11, 2017: Over 60 members and guests enjoyed great food and entertainment at our club party held at the Westgate Church in Weston, MA. Good times and conversations. 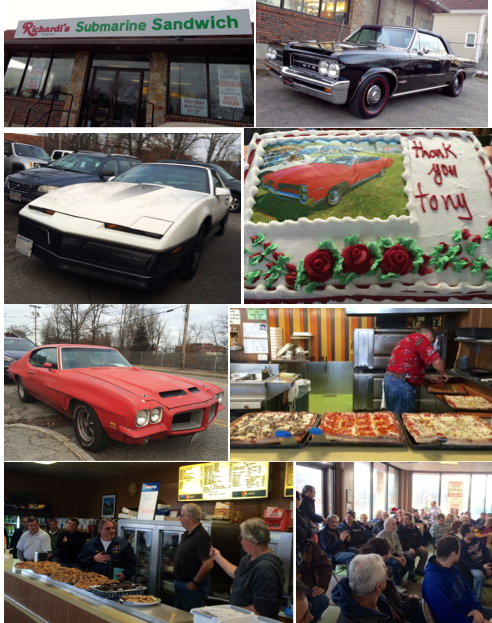 A big “Thank You” to Steve Peluso and all who made this a wonderful club event. The Chuck Wagon catered our party and served up a delicious buffet for the masses. 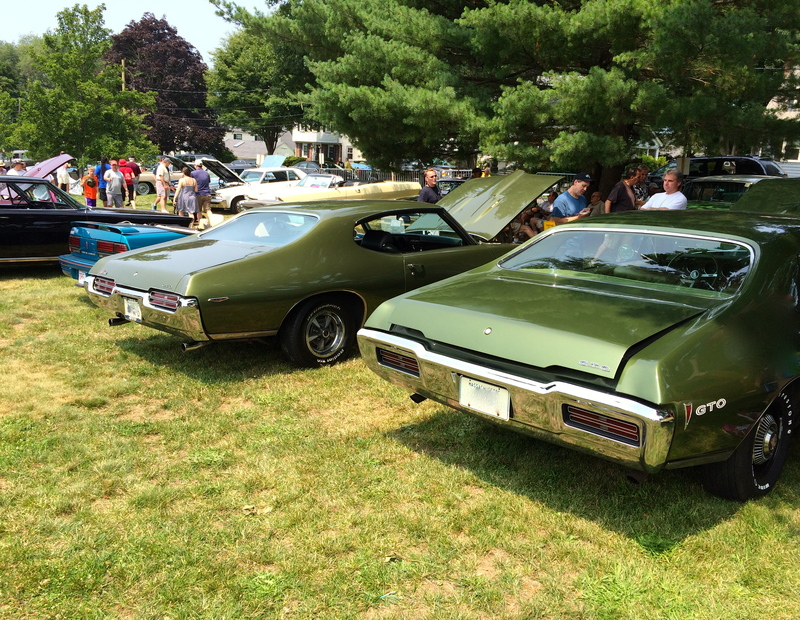 Lots of great raffle giveaways including these 2 Pontiac books donated to us by Motorbooks. 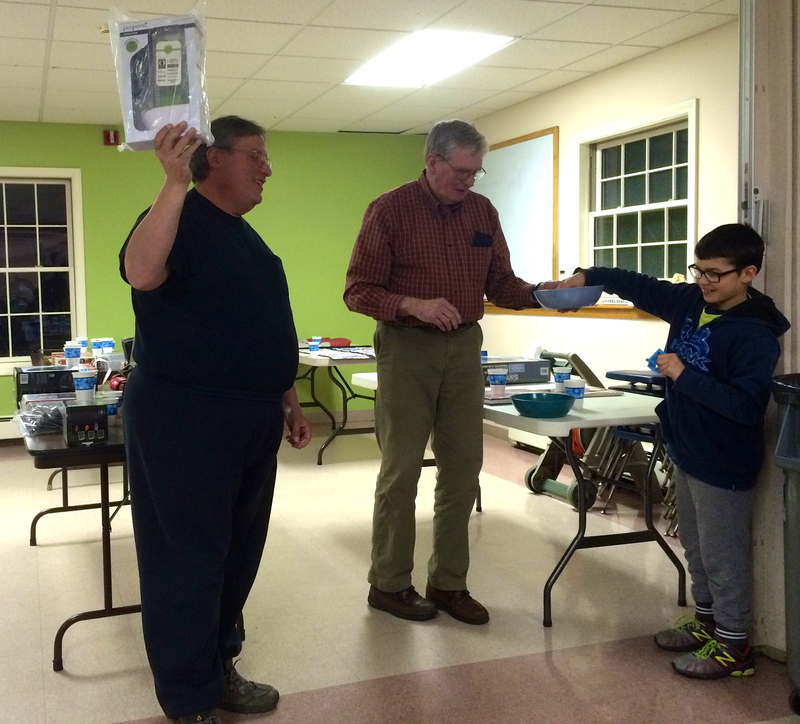 Ron, Merle, and Alex did a great job on the raffle. 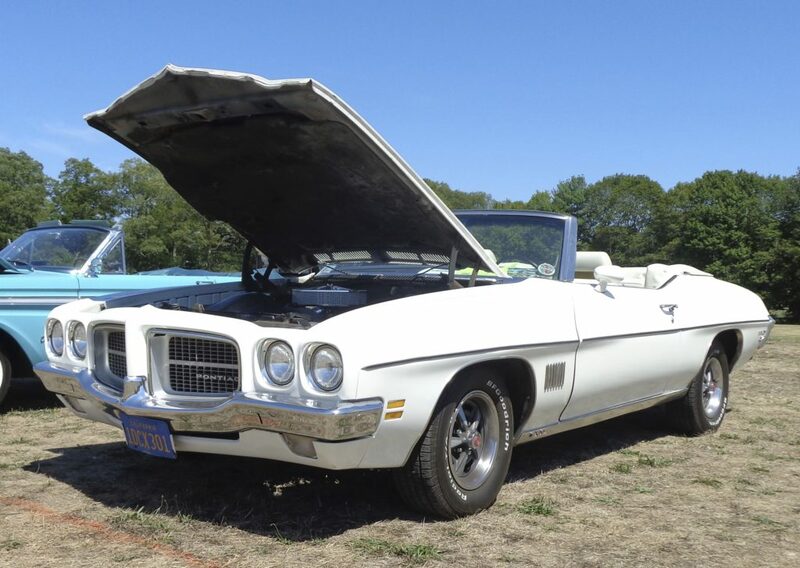 We raised almost $600 for the Pontiac Oakland Museum! 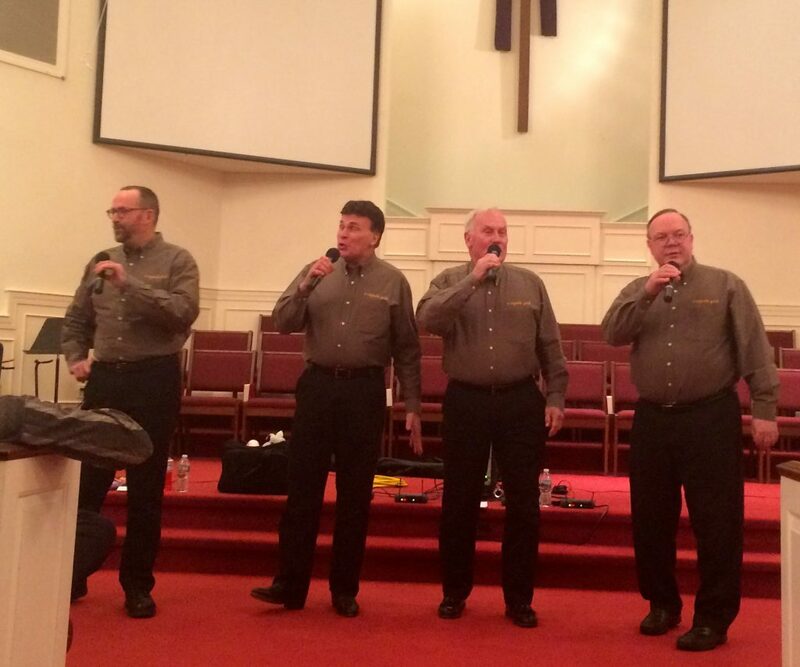 The smooth sounds of A Cappella Gold entertained us. Thanks guys! 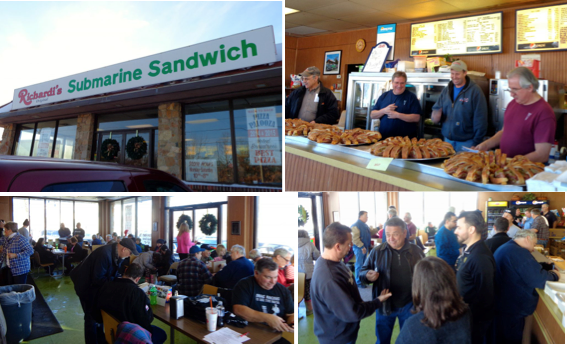 January 8, 2016: Over 50 members and guests gathered at Richardi’s for today’s meeting and club elections. A Big “Thank You” to Dan Richardi for hosting today’s activities. Thank you also to those who ran for club offices and congratulations to those who were elected. 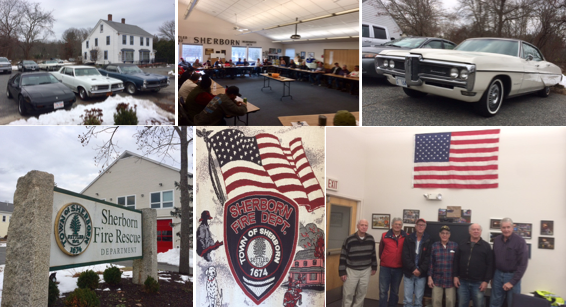 November 13, 2016: Outstanding group of over 40 members and guests gathered at the Sherborn Firehouse for our club meeting. Special thank you to Judy and Bruce Muldoon for hosting todays event. 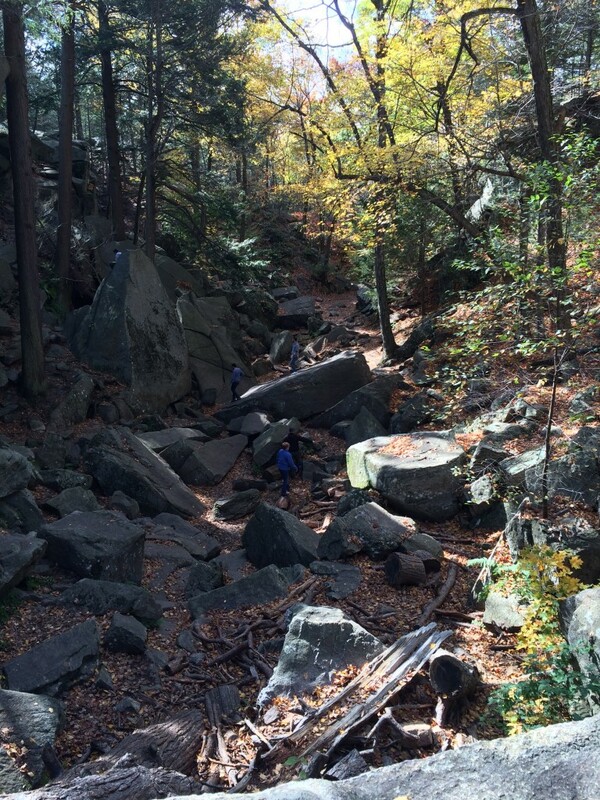 October 16, 2016: Beautiful day for our Fall Foliage Cruise to Purgatory Chasm in Sutton, MA followed by our club meeting hosted by Lucille and Rick DiGiacomo in Rhode Island. 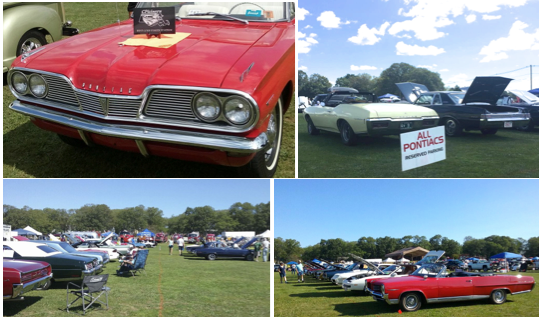 September 16, 2016: Spectacular day at the Pontiac Celebration in Warwick, RI. 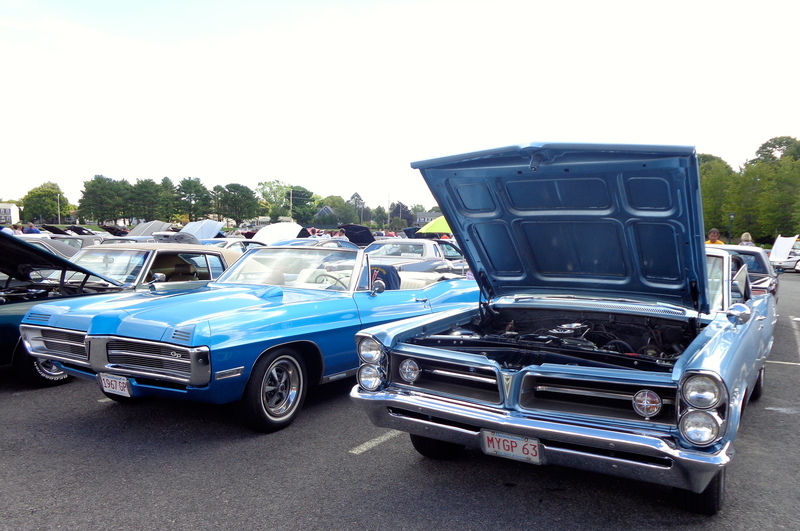 Hundreds of Pontiacs gathered to fight childhood cancer. 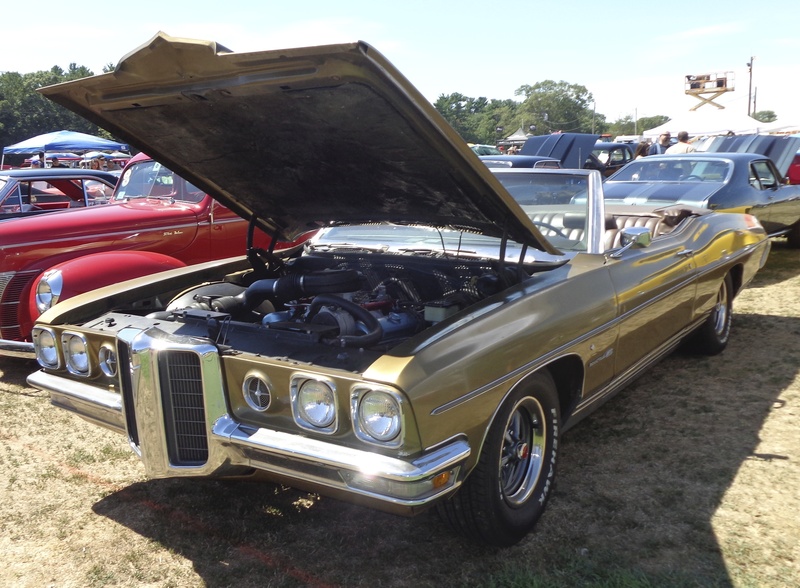 This is a wonderful regional event that brings in Pontiacs from all over the northeast. 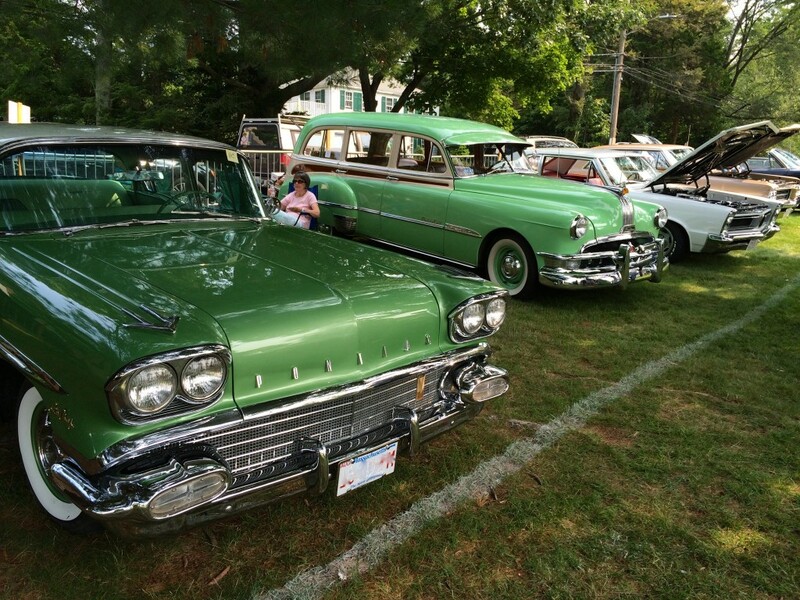 Thank you to Lucille and Rick DiGiacomo and their team for putting on another wonderful event. 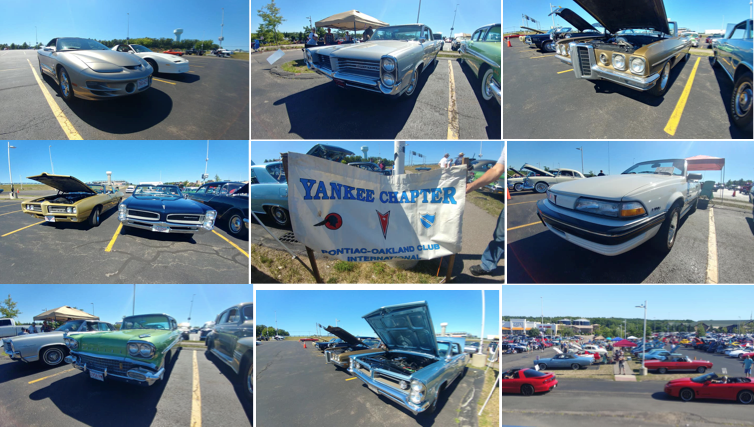 Big shout out to all the Yankee Chapter members who assisted in the show and those in attendance. 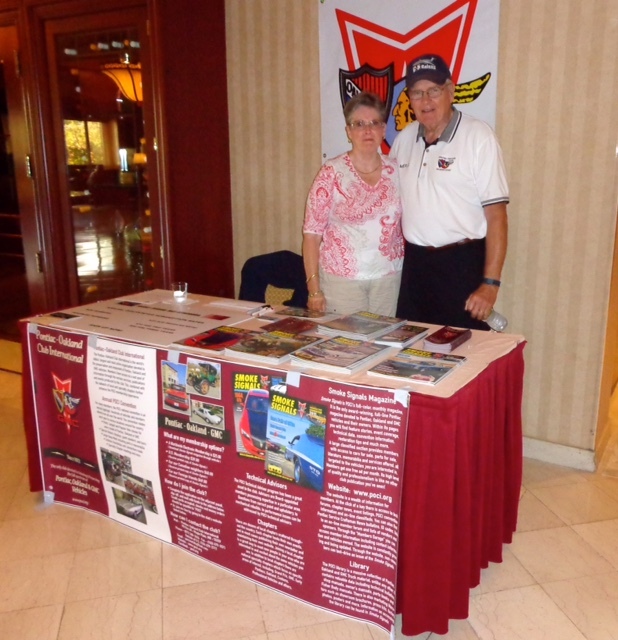 Club members Ann Marie Mandarano and Merle Green working the POCI table. 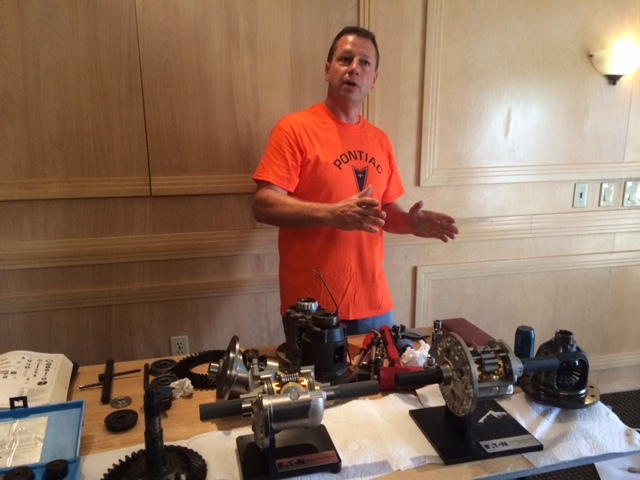 Club member Dave Kantarges did an outstanding presentation on rear differentials that included components, GM tooling, and factory samples. Nice job Dave! 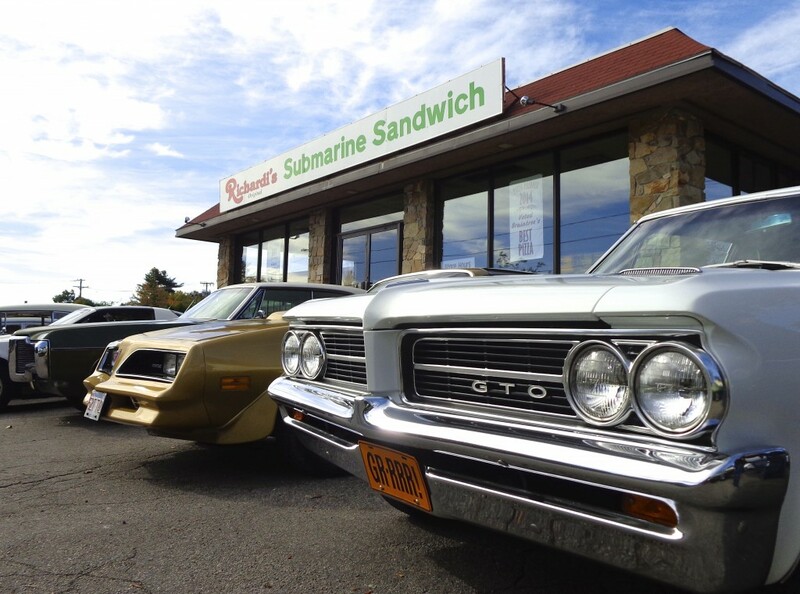 ’64 and ’65 stock GTO class. 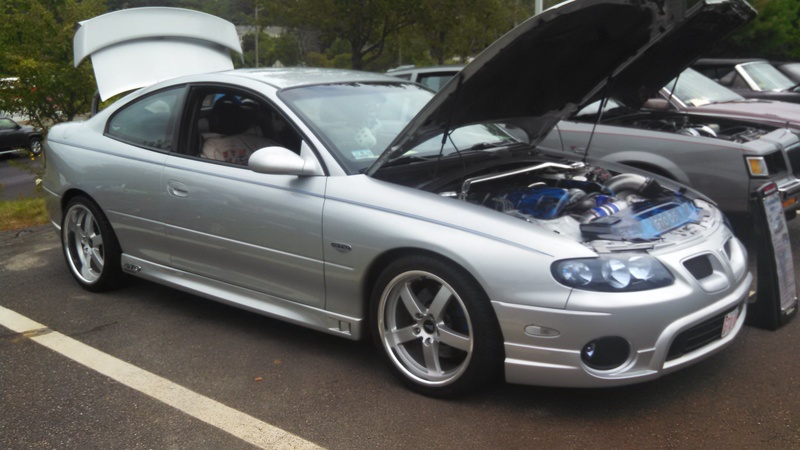 ’04 -’06 GTO’s were well represented. 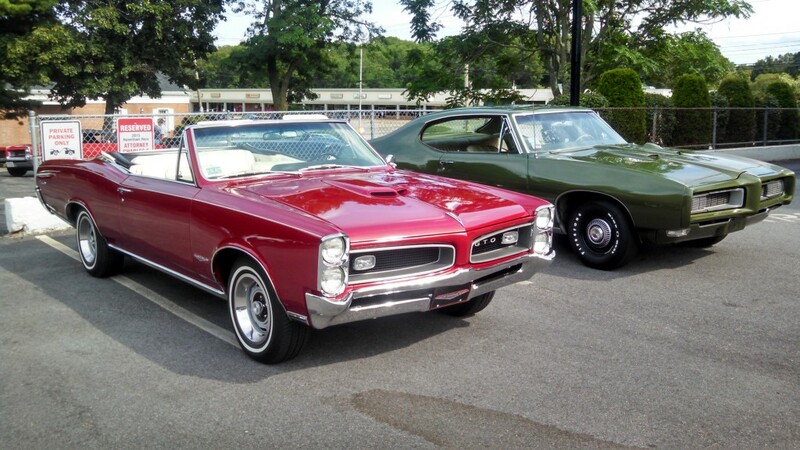 Steve’s ’67 and Ron’s ’63 Grand Prix. 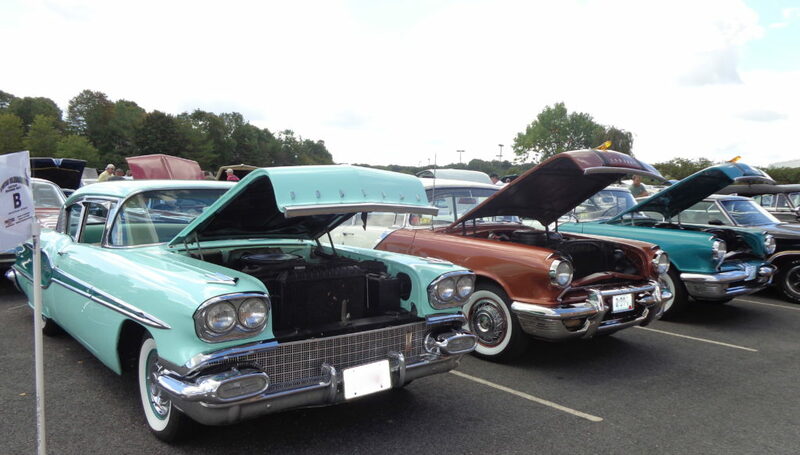 Lots of ’50’s era Pontiacs in the house. September 11, 2016: 30+ members and guests turned out for todays meeting at Kimball Farm in Lancaster. A Rainy morning gave way to sunny blue skies and a beautiful day. Special Thank You to Julie and Ron Senesi for making all the arrangements. 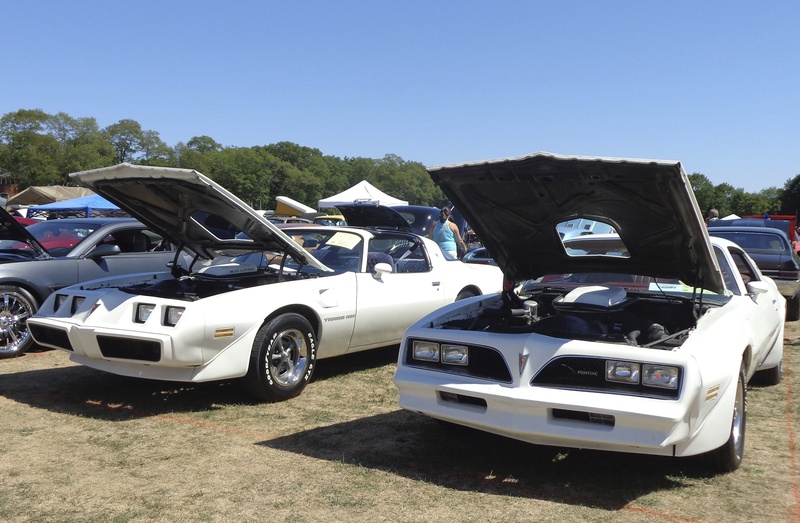 August 21, 2016: Mass Cruisers “Autofest” at the Wrentham Fairgrounds. 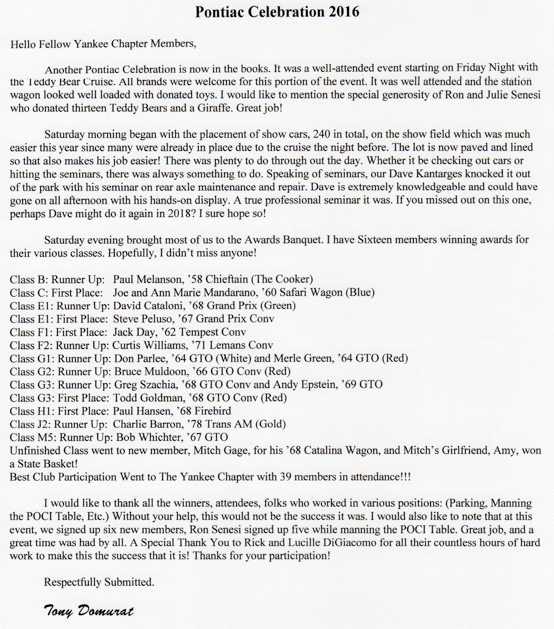 Yankee POCI had 20 member rides on hand to take the Club Participation trophy! This is the 5th consecutive year that we’ve won this award. Nice job by all who attended! 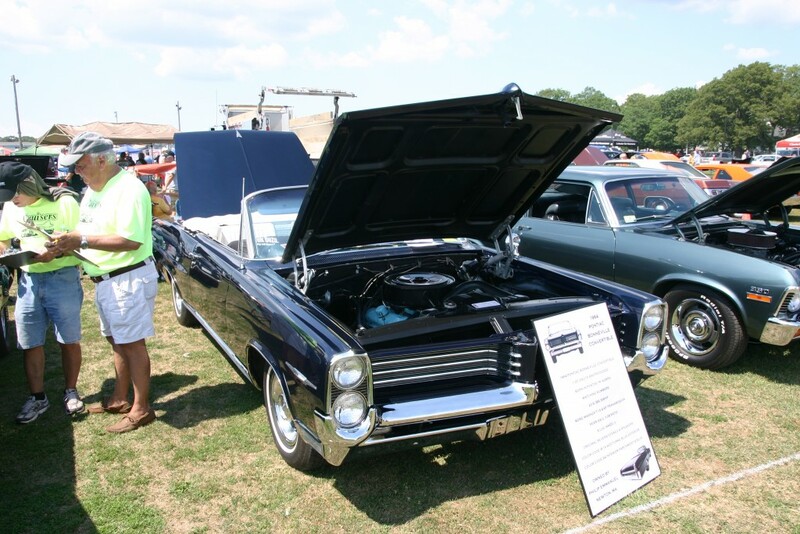 July 24, 2016: 1A Auto Show at Pepperell Town Field. 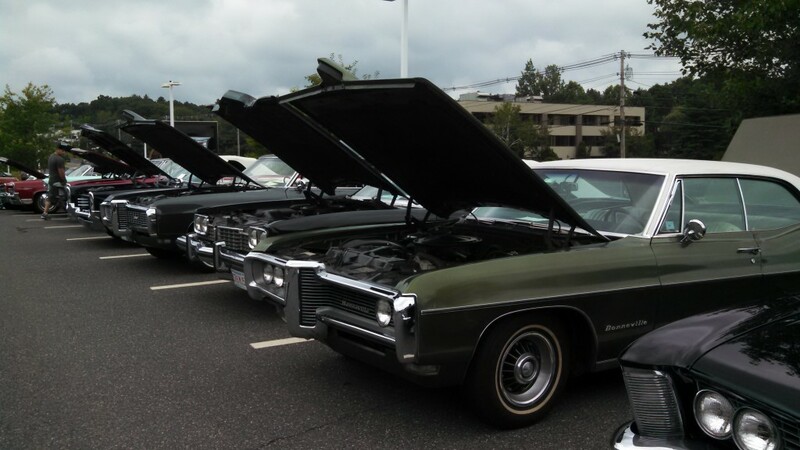 Great club turnout with over 30 member cars in attendance. 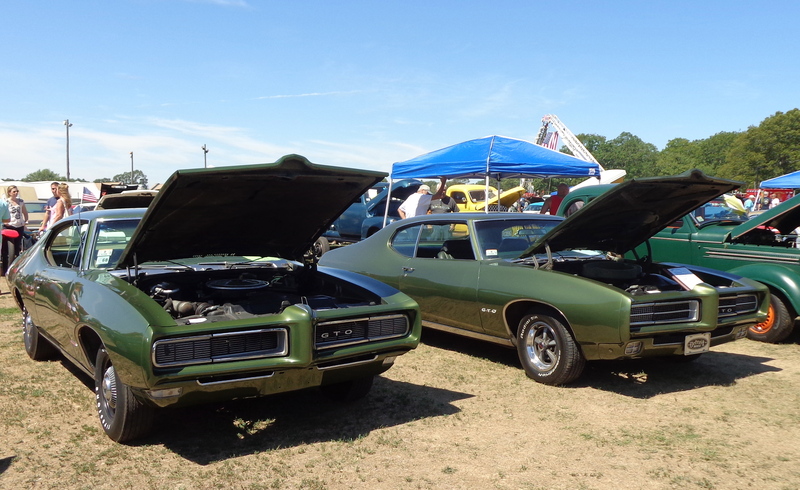 June 12, 2016: A nice day at the Tulley Show at the Bud Plant in Merrimack, NH. 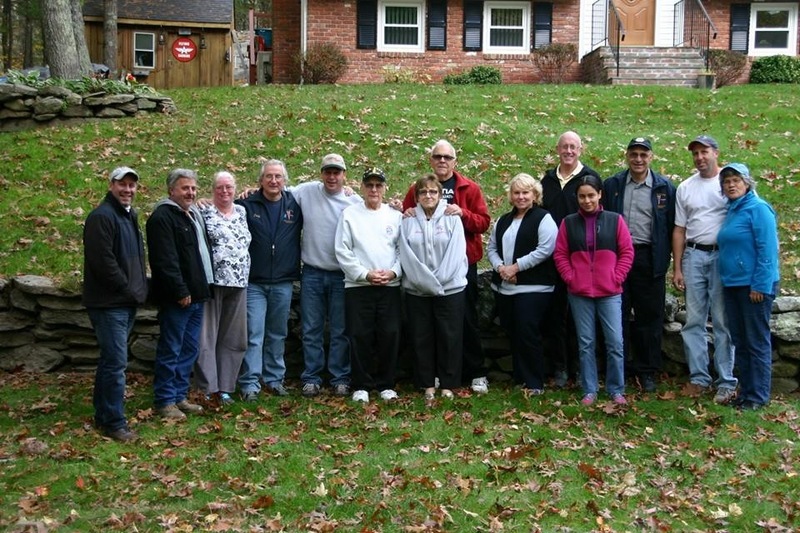 Afterwards, about 20 of us gathered at Janice and Merle Green’s house for our club meeting. Tulley Show at Bud Plant. 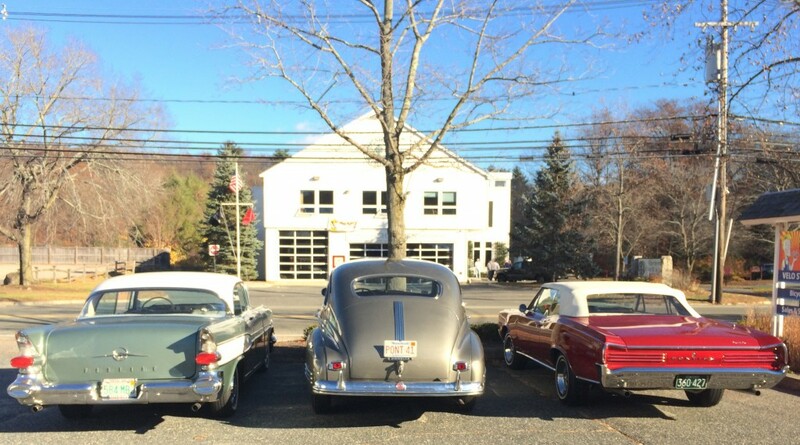 Row of Buicks. 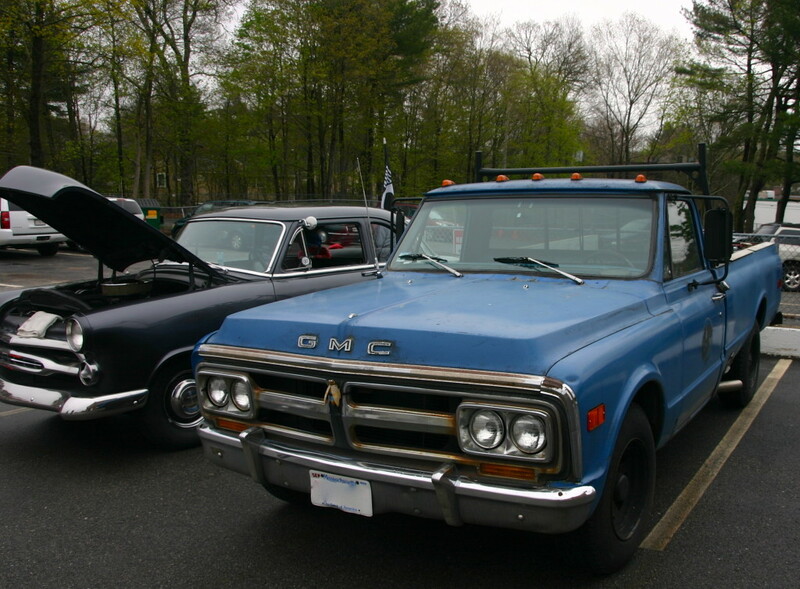 The 68-72 GM “A” Body class. 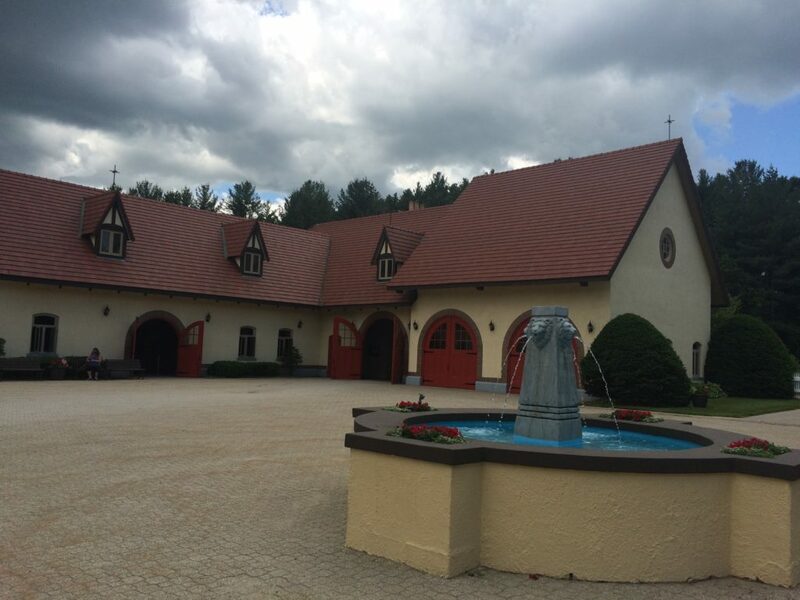 Beautiful stables. 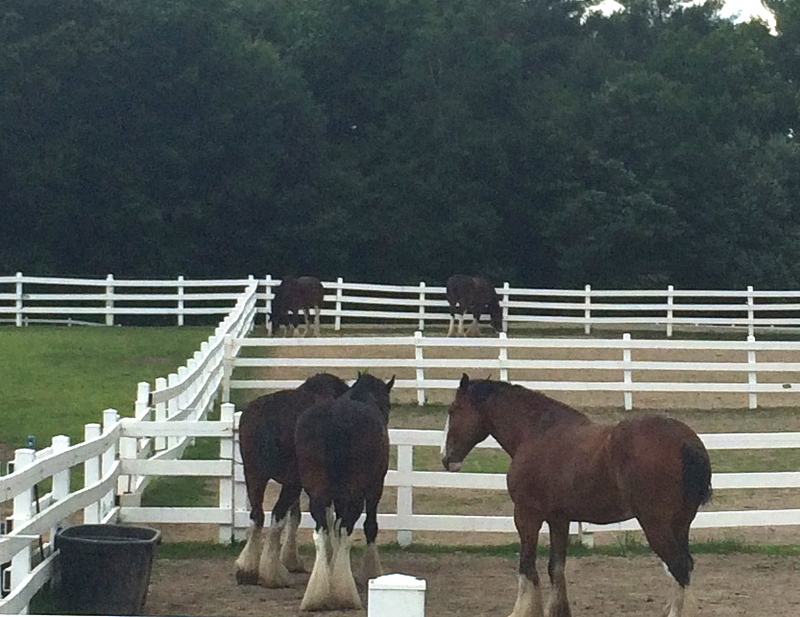 Home to the Clydesdales. The real stars of the show. The Budweiser Clydesdales. 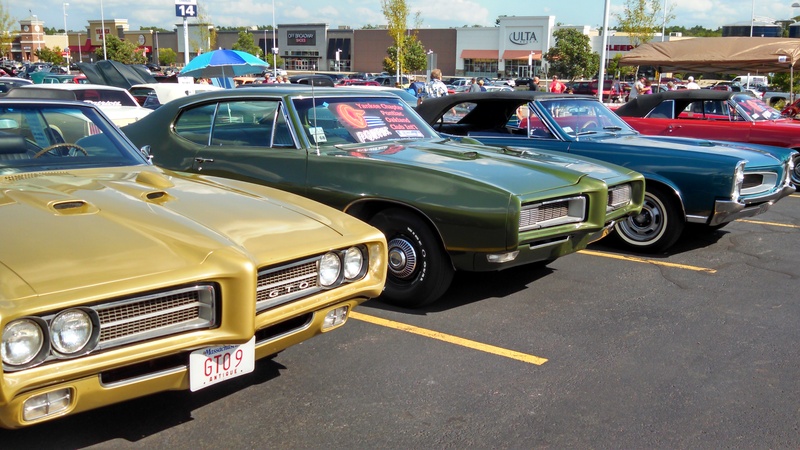 A lot of horsepower here. Club meeting at the Greens. 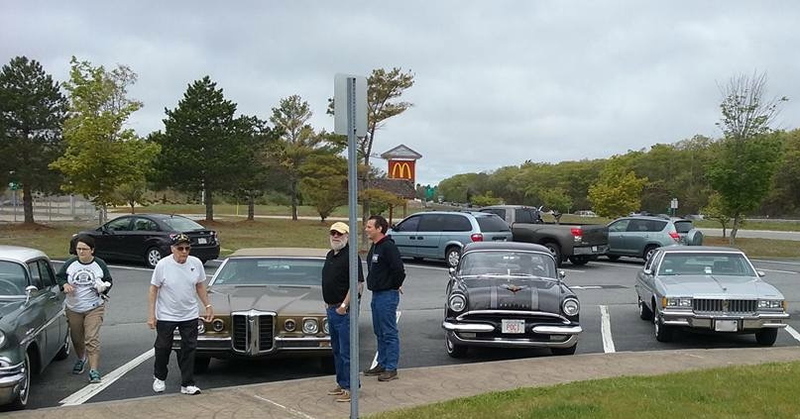 May 22, 2016: The weather held up nicely for a small but dedicated group of club members on our Spring Mystery Cruise thru the South Shore. 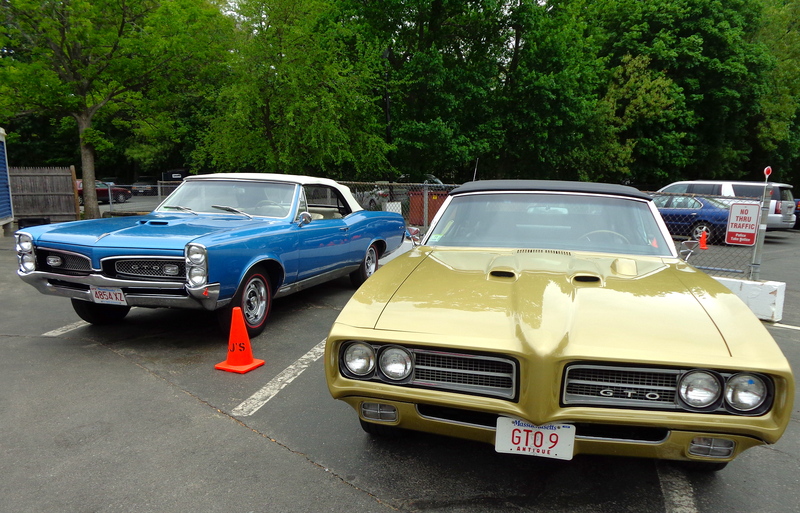 May 7, 2016: A nice crowd gathered under overcast skies and light rain for our annual Dust-Off at CJ’s in Framingham. A big THANK YOU to all who braved the tenuous weather. 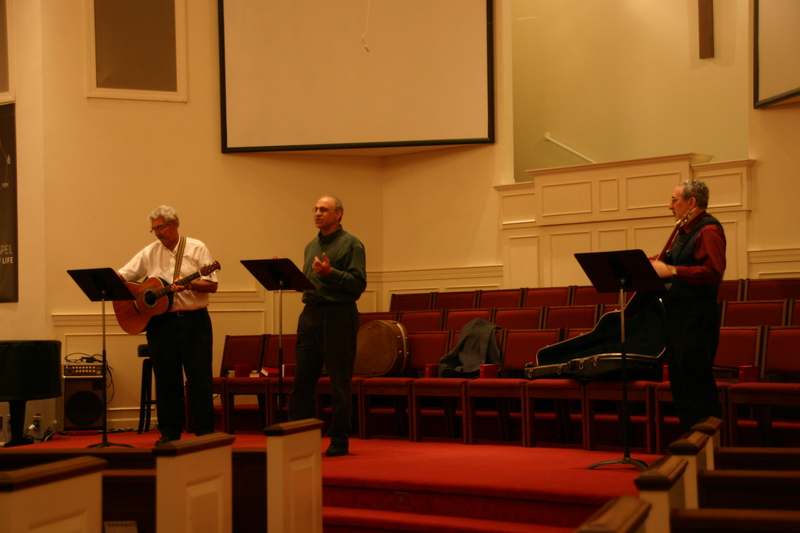 March 5, 2016: Over 50 members and guests gathered at the Westgate Church in Weston for our Annual Anniversary Party. Dinner was catered by our friends at Dello’s of Dedham. 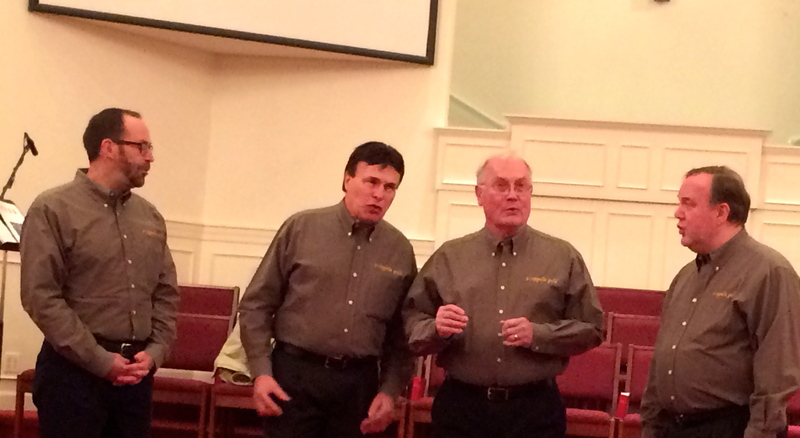 Spectacular entertainment provided by A Cappella Gold. 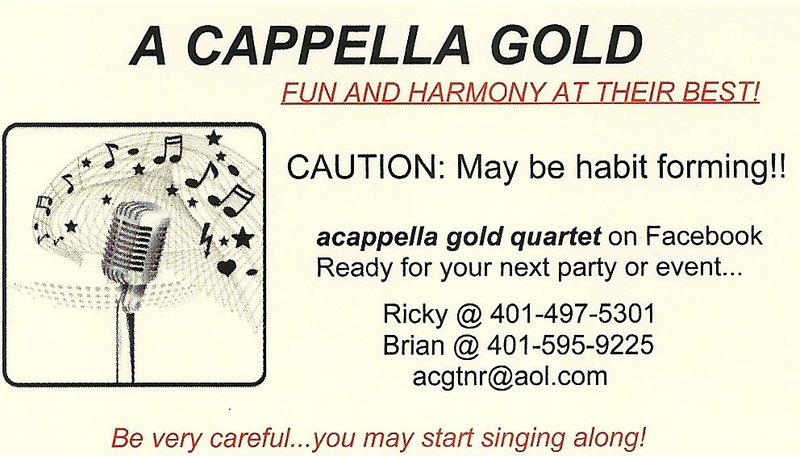 See A Cappella Gold’s Facebook page at: Very special “Thank You’s” go out to Tony and Shelia Domurat, Steve Peluso, Merle Green, Ann Marie and Joe Mandarano, Ron Senesi and all those who helped make a fun and successful night. 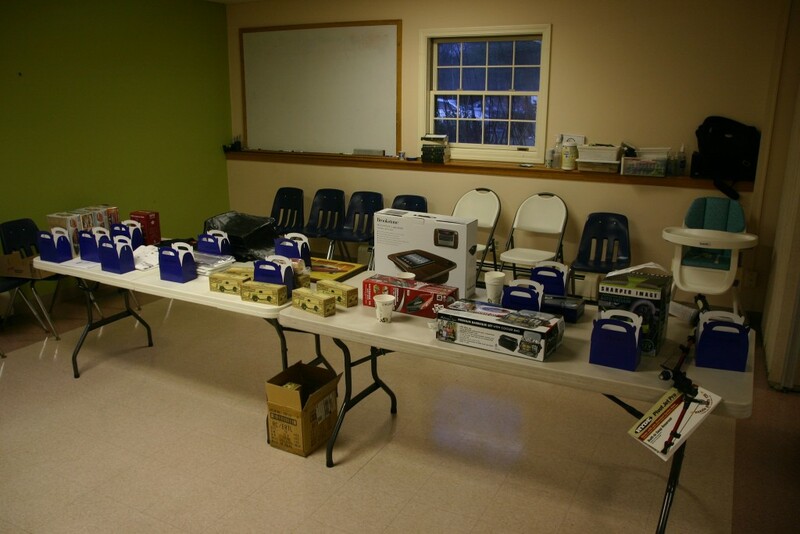 In addition, our raffle raised $500 for the Pontiac Oakland Museum in Pontiac, IL. Good job everyone! 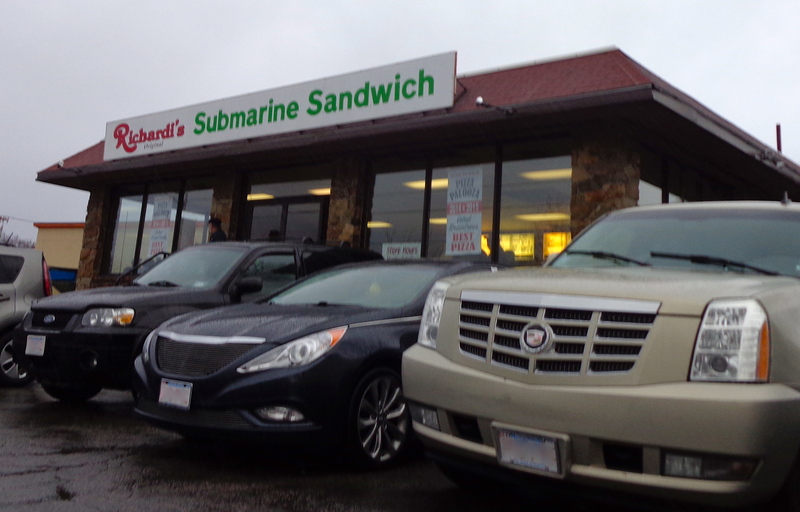 January 10, 2016: Elections Meeting at Richardi’s Sandwich Shop in Braintree, MA. Congrats to Tom Dubois for being voted our new Secretary. 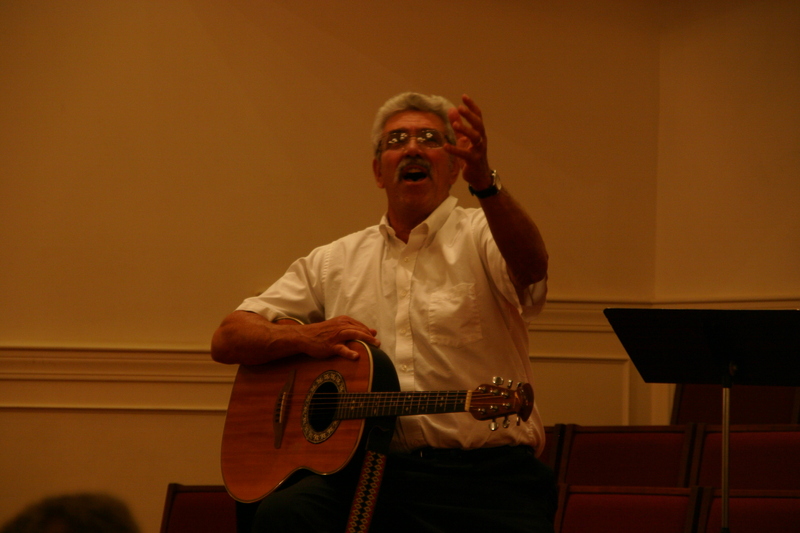 A special thank you to Merle Green for serving in that role for the past few years. 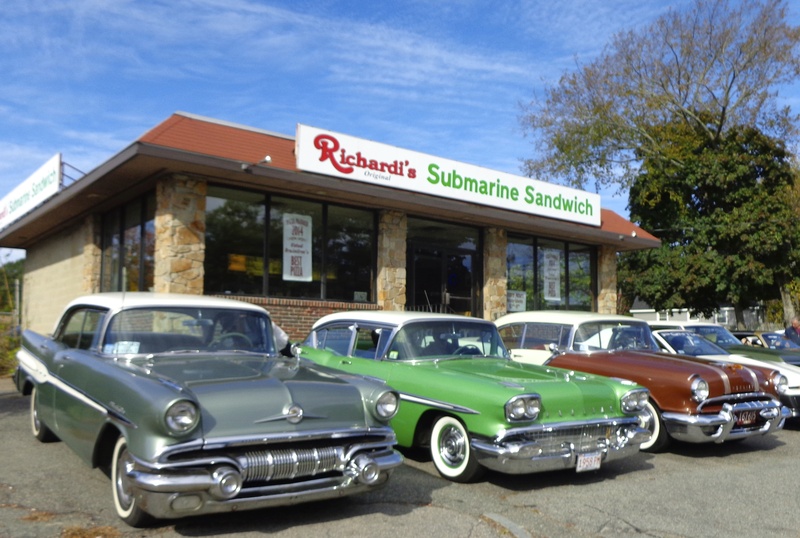 Torrid downpours didn’t prevent a hearty crew of 30+ members from attending this afternoons meeting at Richardi’s in Braintree. Left to right….Secretary Merle Green taking copious minutes, Club President Tony Domurat running todays very important elections, and VP Paul O’Toole assisting in the activities. Our host for today’s festivities is Dan Richardi. 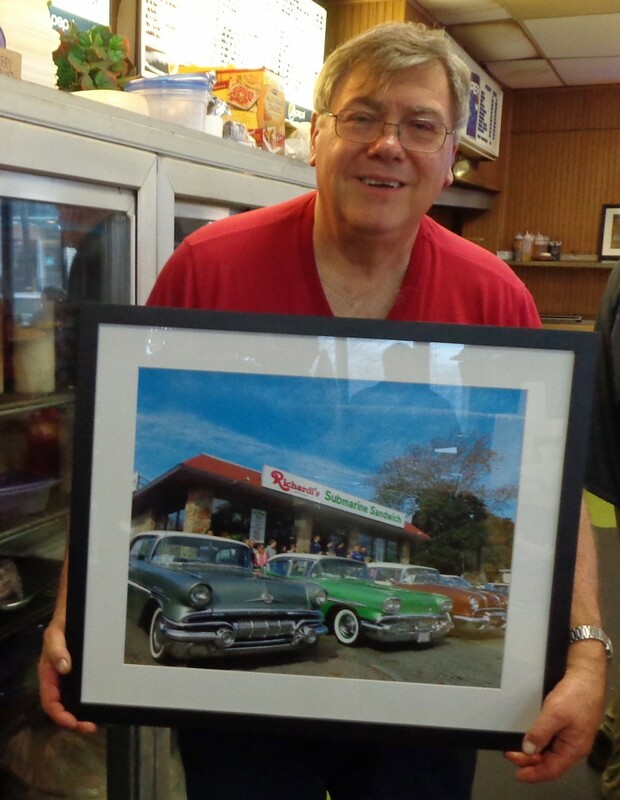 As a token of our appreciation, President Tony Domurat presented Dan with this framed picture taken of some of our cars in front of his shop. 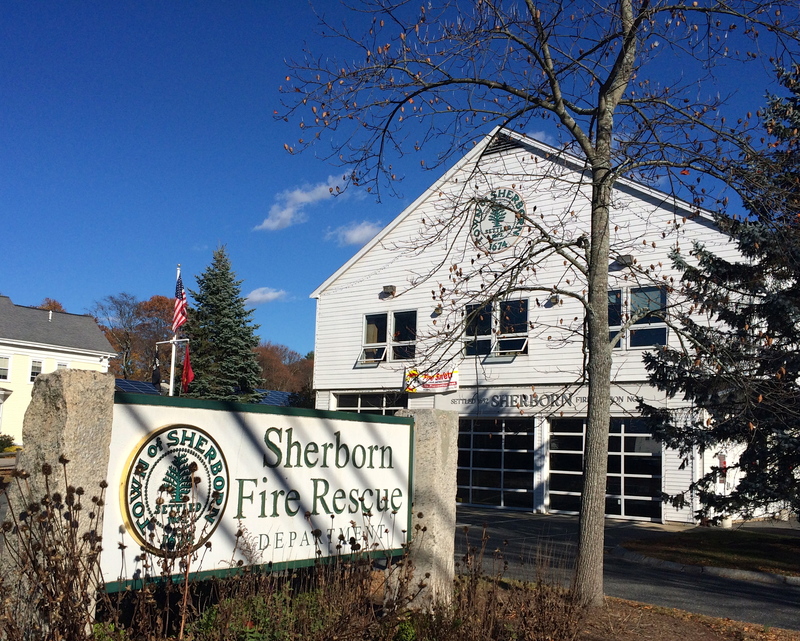 November 8, 2015: Meeting at the Sherborn Firehouse hosted by Judy and Bruce Muldoon. Shoutout to our Veteran members. Happy Veterans day to you and all who have and continue to serve our country. Thank you Larry, John, Lou, Les, Tom, Chris, and Merle. 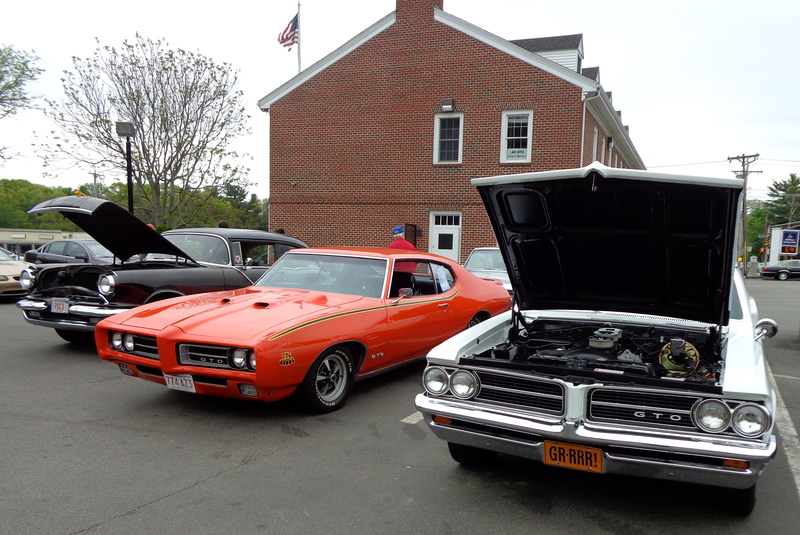 October 11, 2015: Annual Mystery Fall Foliage Cruise through southern MA. 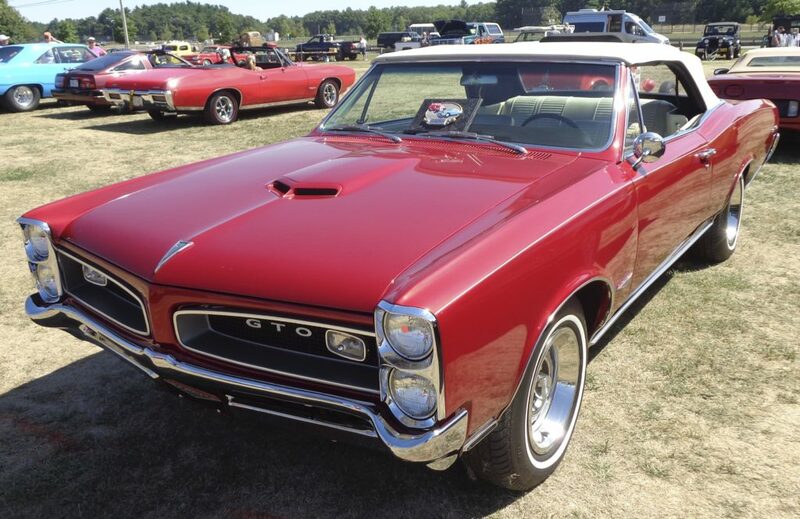 Spectacular weather….sunny near 70 degrees. 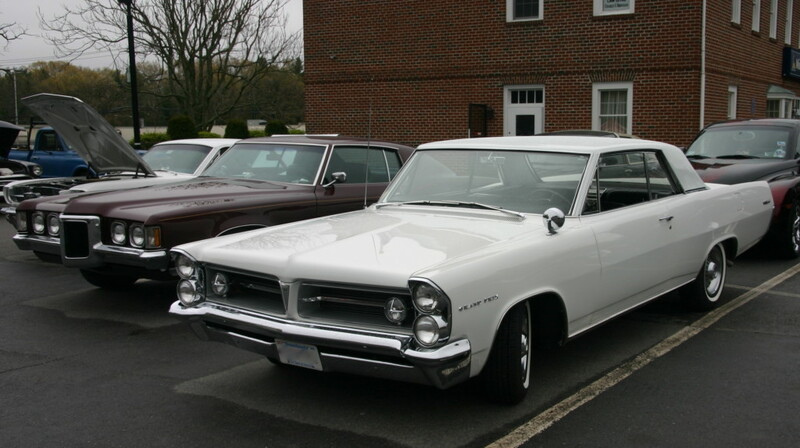 Perfect day for a cruise on the backroads. 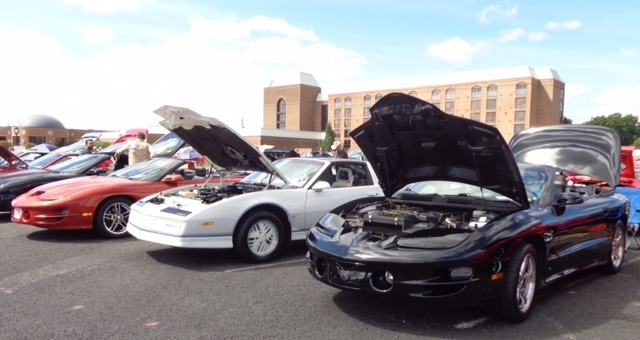 We had 15 cars on tour and met another 3 at the Plain Ridge Casino in Plainville. Great day had by all! 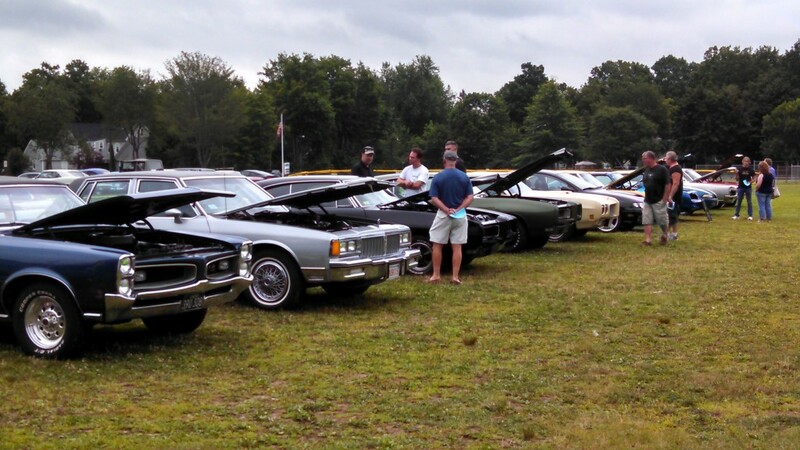 Sept 13 2015: Club Meeting at Kimball Farm in Lancaster. 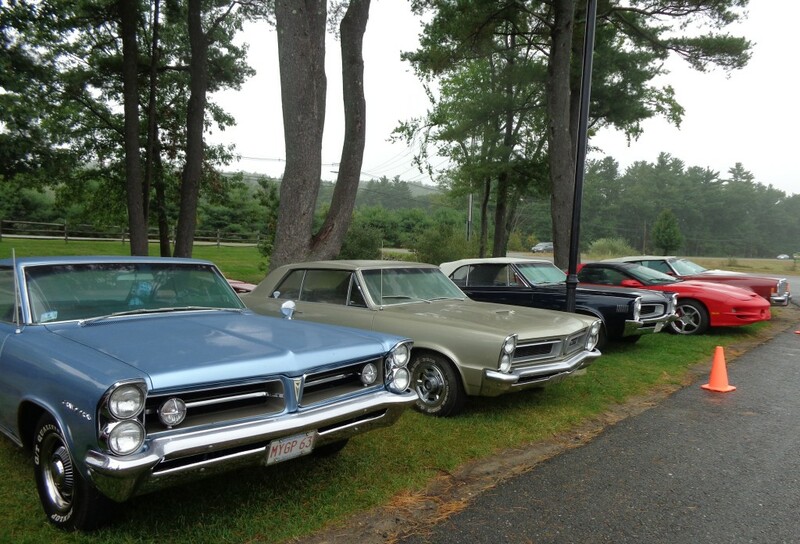 A misty day didn’t keep a few dozen of us from getting together. Good to see a few new members in attendance. 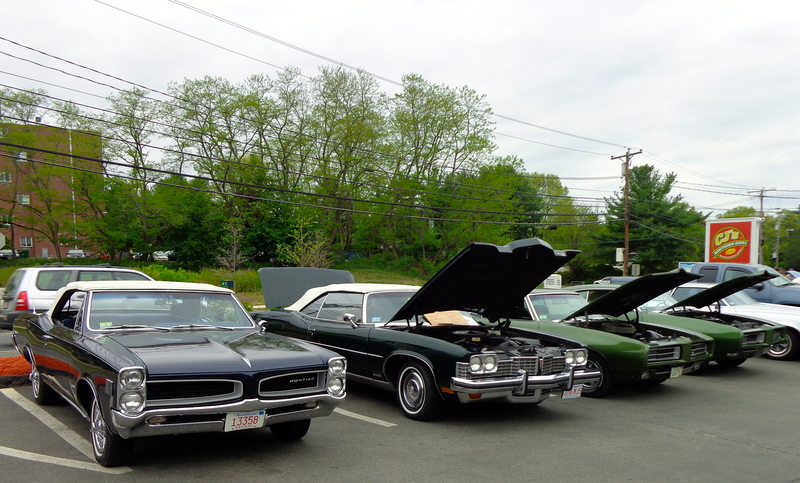 Even with clouds and the threat of rain people gathered at Long Cadillac in Southborough, MA. 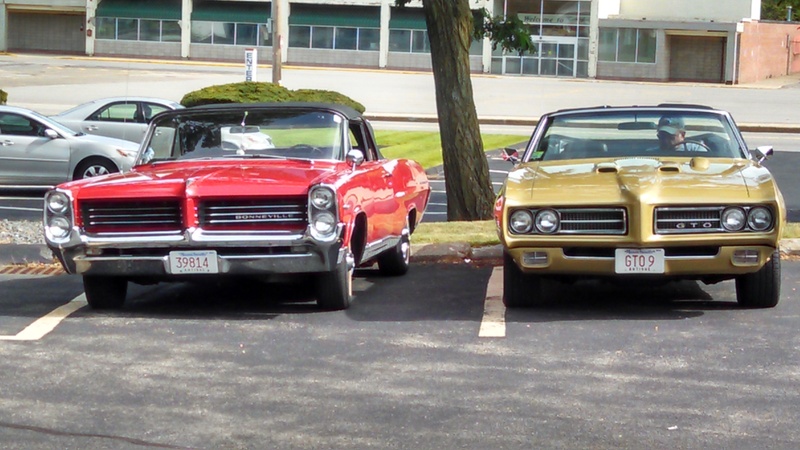 for the show put on by the Cadillac LaSalle Club. 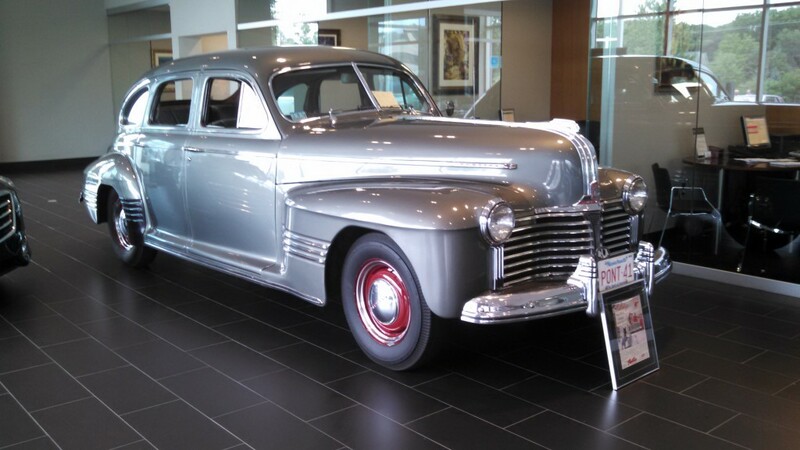 Many concours and modified cars were on display and the dealer allowed some of the best to be displayed in the showroom normally reserved for new cars! 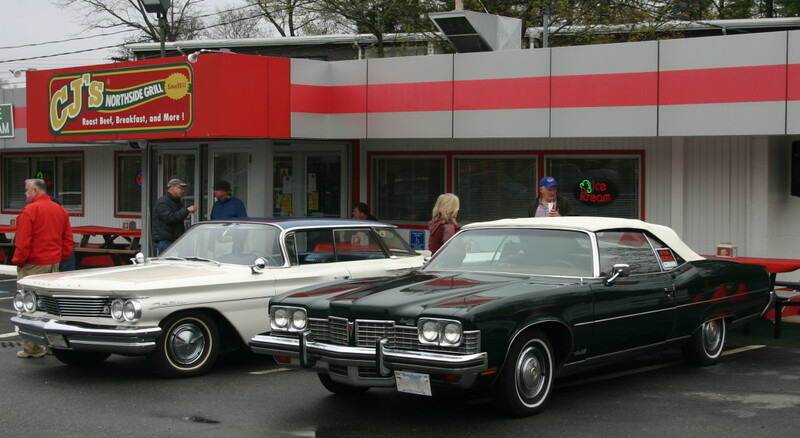 Long Cadillac also provided food and drink free of charge. 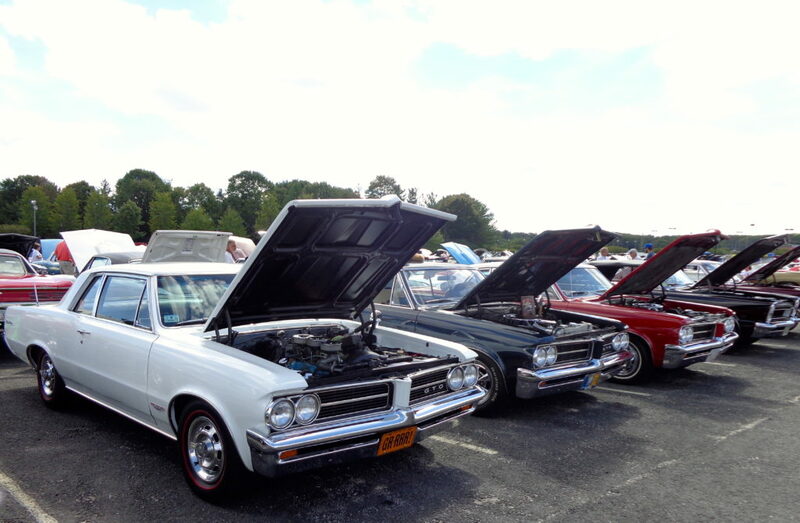 Members came early for the fun and the cruise filled up fast. 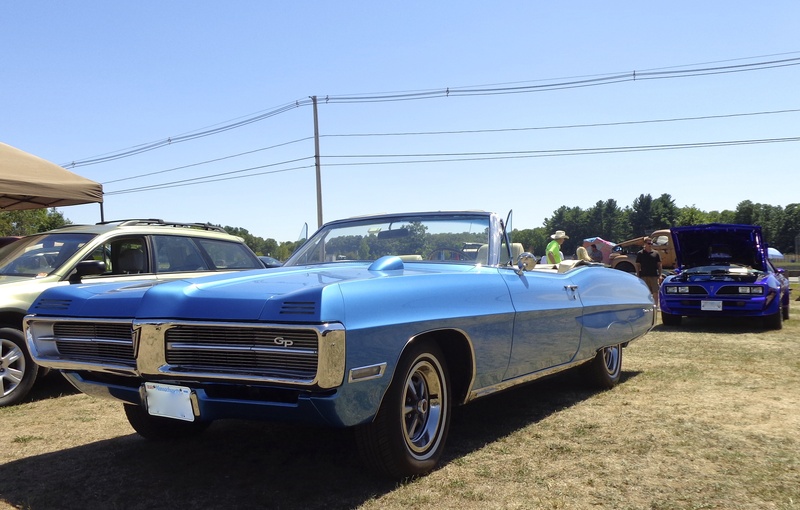 Everyone enjoyed looking at all the cars and watching them drive in. Compliments were received on our new Club Banners. 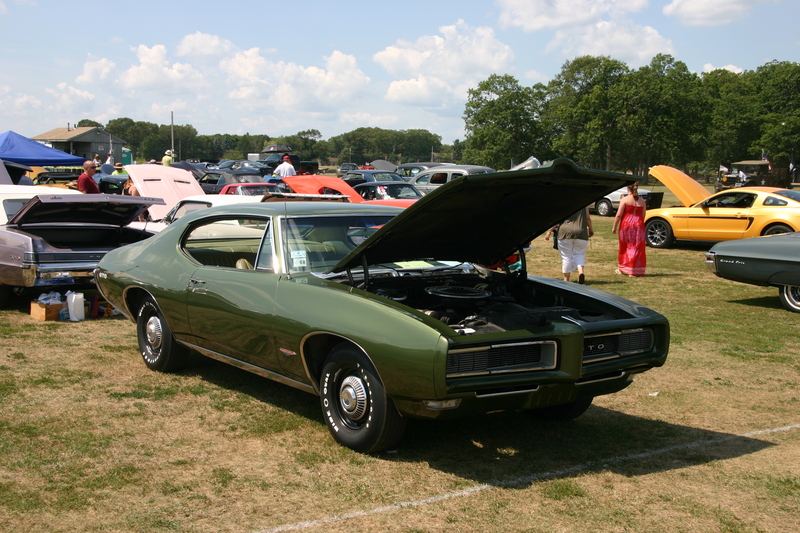 If you look close one of the new banners can be seen on the windshield of the 1968 Verdoro Green GTO pictured below. 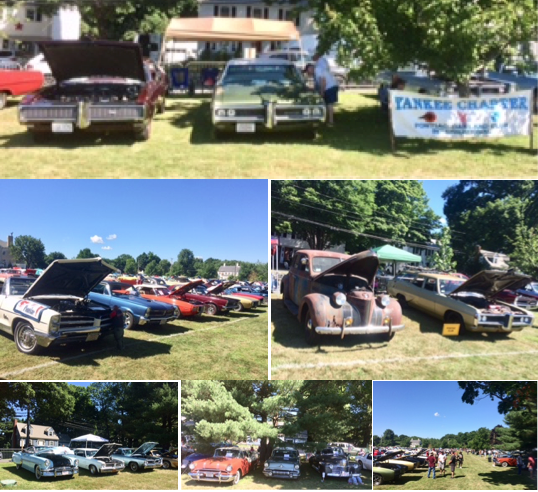 Yankee Chapter members gathered at the Mass Cruisers Car and Truck Show in Wrentham for a sunny an hot day. 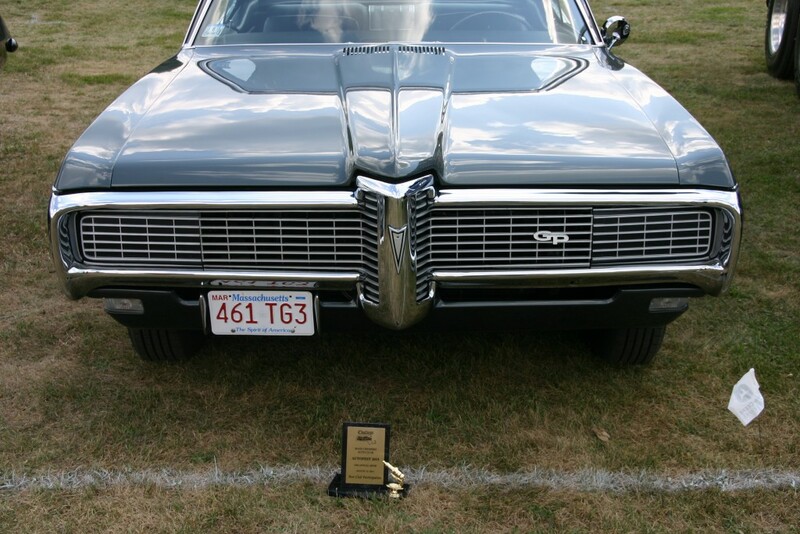 Below member Dave C.’s 1968 Gran Prix, is a trophy he accepted on behalf of our Club for ” Best Club Participation ” at the show. This is our 4th year in a row for this award. We can’t wait for next year! 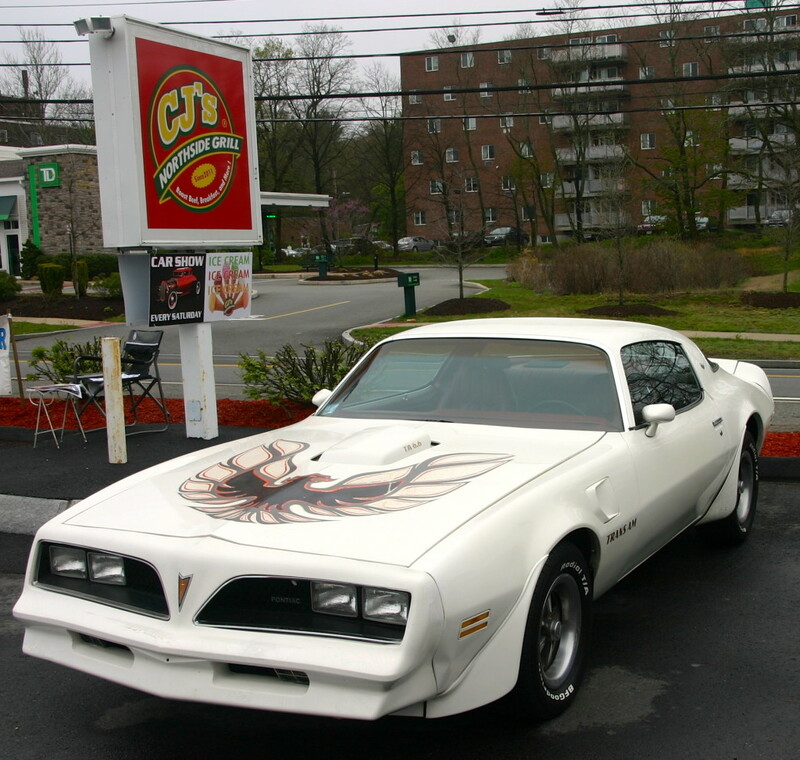 Members gathered for delicious food and cold drinks at CJ’s in Framingham, MA. 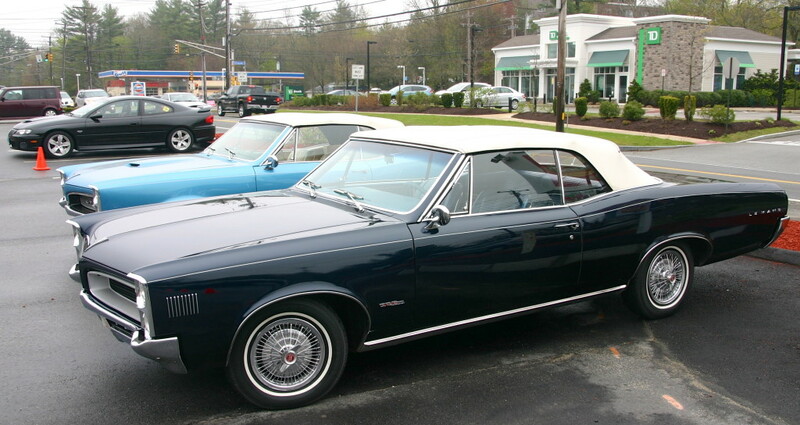 for the monthly club meeting. The roast beef was popular as always and the ice cream smooth and creamy. 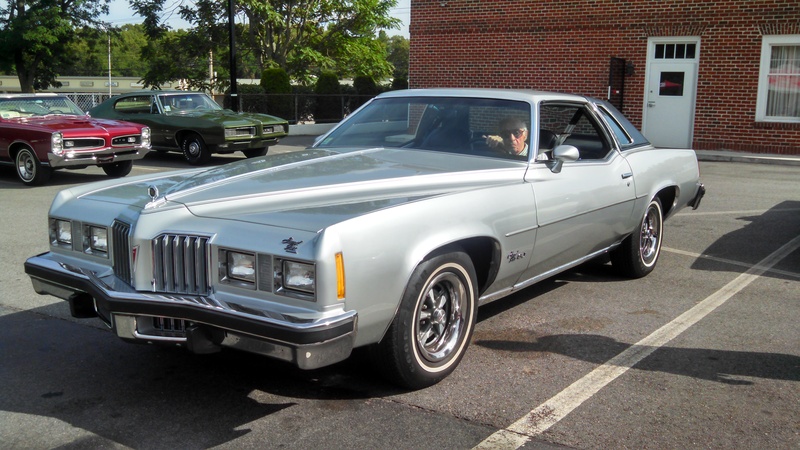 Club members showed their waxed and polished Pontiac’s in the bright sun and shared stories and all had fun. July 26 2015: 1A Auto Show Another great show and fun time was had at the 1A Auto show in Pepperell, MA. 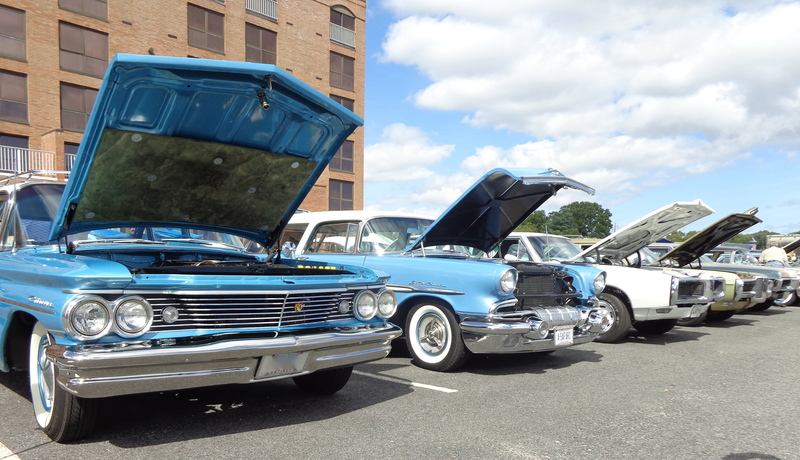 Despite the threat of rain throughout the day there was a great turn out of classic cars and automotive enthusiasts. 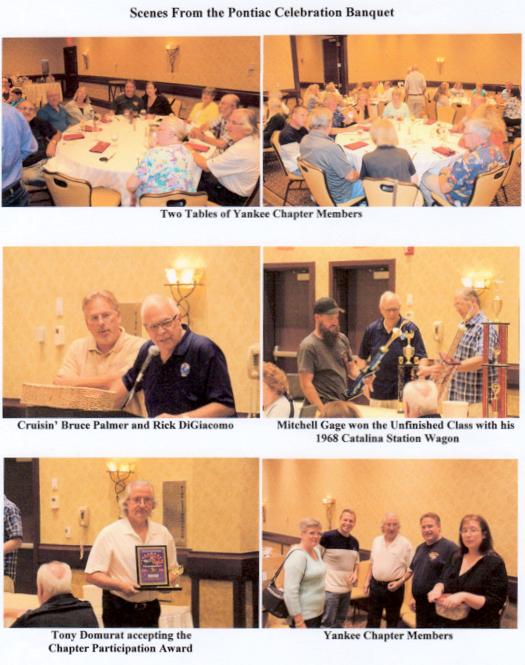 A good time was had by all and some Yankee chapter members went home with Trophies. 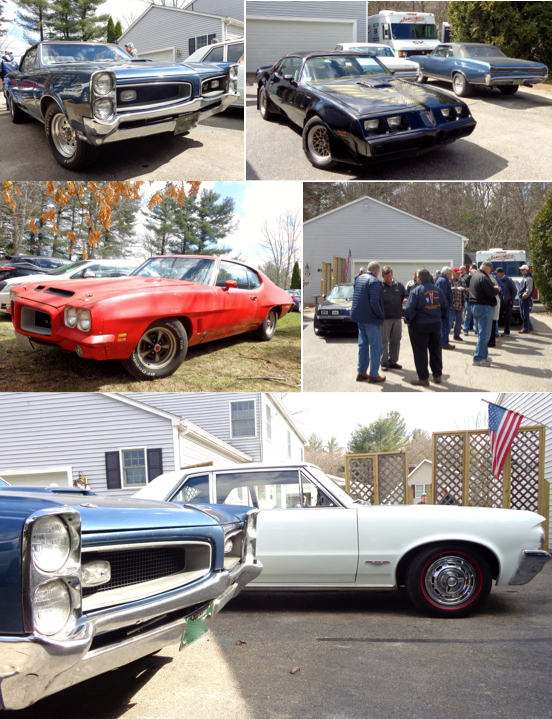 May 16, 2015: Yankee POCI Dust Off at CJ’s Norhside Grill in Framingham. 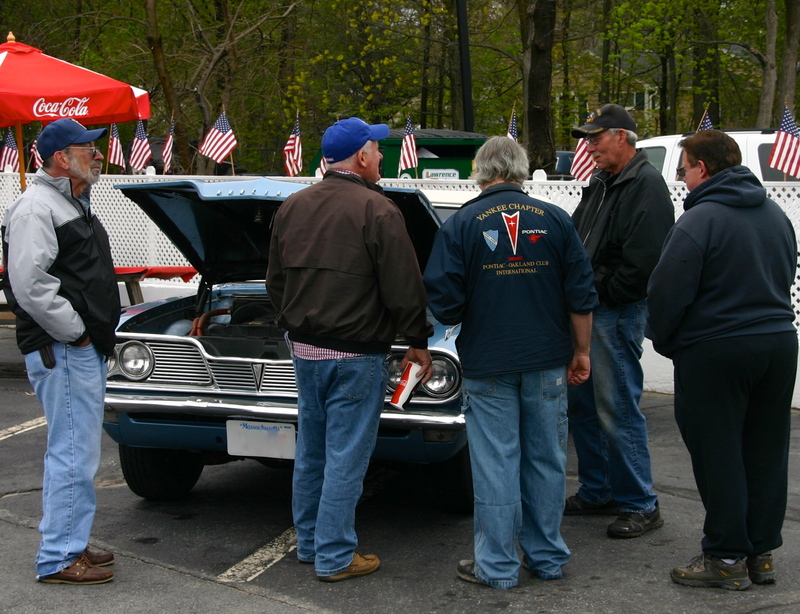 March 2015: Club Anniversary Party. Entertainment Provided by The East Boston Irish Quartet! 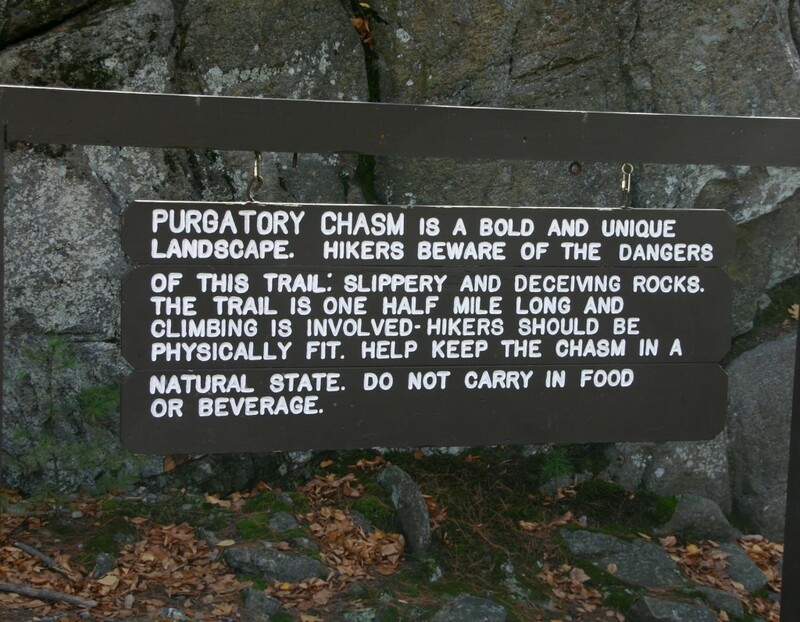 Fall 2014 Cruise to Purgatory Chasm in Sutton, MA followed by club meeting at Lucille and Rick’s home in RI.